Strolling east from Astor Place we enter the so-called “East Village” – actually the northern reaches of the Lower East Side. Now this is an area with “character. ” It seems – at least in appearance – to stubbornly resist the radical upgrading occurring almost everywhere else on the island of Manhattan. In recent decades the East Village has been better known for its drug scene and ancillary industries: tattoo parlors, “purveyors of Day-Glo paint” etc. 1) But there is much more here than just the alleged “counterculture.” The East Village abounds in curious buildings and relics left by earlier ages and earlier inhabitants: Germans, Irish, Jews, and Italians. 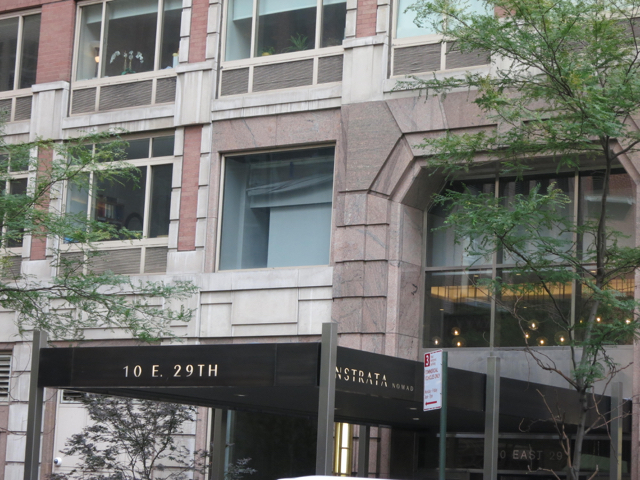 Moreover, this neighborhood still shelters perhaps the only remaining presence of Christian and Catholic European ethnicity on Manhattan Island. Every year chips away at this remnant: Kurowicky’s Meats closed in 2007; Surma Ukrainian shop closed just this year after 98 years in business. But much of interest still remains. Of these nations the Ukrainians of the Eastern rite are by far the most visible, with their splendid church of St George, built as recently as the early 1970’s, and their various restaurants and other institutions scattered over the neighborhood. Just over the northern border of this area we have on East 15th Street the church of St. Mary of the closely related Ruthenians. 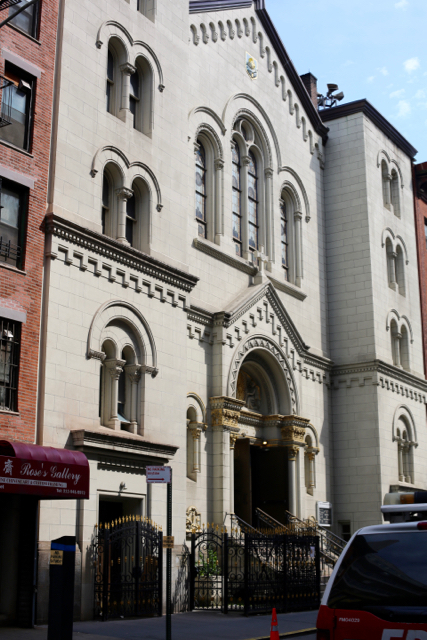 The Orthodox are also well represented, with St Nicholas of Myra church on Tompkins Square (Ruthenians) and the Orthodox cathedral of the Protection of the Holy Virgin on East 2nd street. 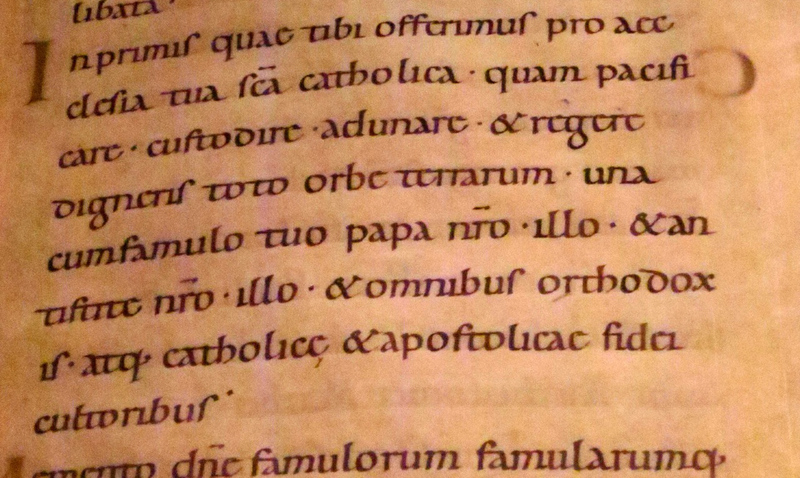 I want to focus here, however, on Latin Catholics. 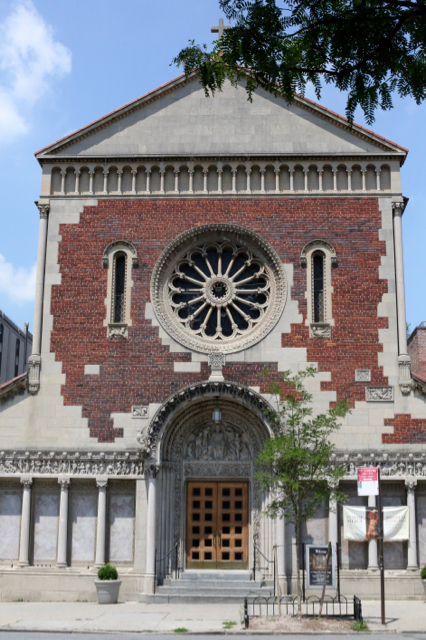 I have described elsewhere in this series the “mainstream” parishes (originally Irish, German and Italian – later Hispanic) that existed (or until recent Archdiocesan actions, did exist) in the East Village. Here we will cover two ethnic holdouts. 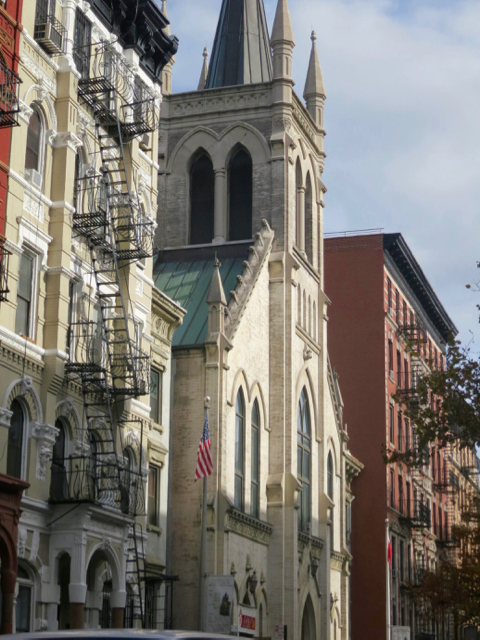 St. Stanislaus is the surviving Polish national parish in Manhattan. 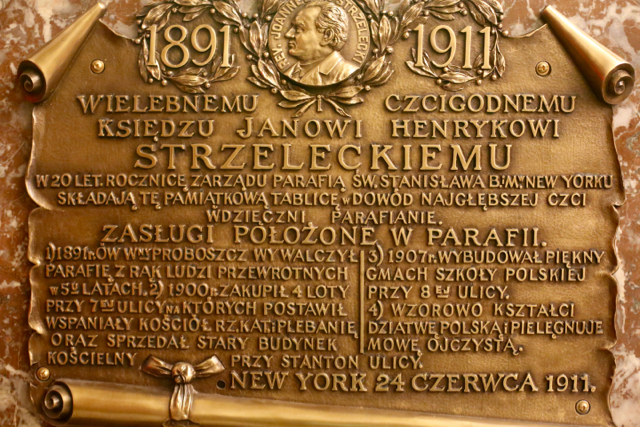 Poles never acquired in the New York region the prominence they have in Chicago and elsewhere in the Midwest. And even then, one thinks of Greenpoint, Brooklyn or even Eastern Long Island, rather than Manhattan, as the major centers of Polish life in New York. But wherever they are, Poles have jealously defended their religion, language and culture. For them, the union of Faith and Nation is self-evident. And however abhorrent this formula is to the Conciliar Church, we cannot question its effectiveness – just ask the surviving leadership of the former Soviet Union. The visitor enters through the doors of the plain façade into a dark vestibule or narthex. 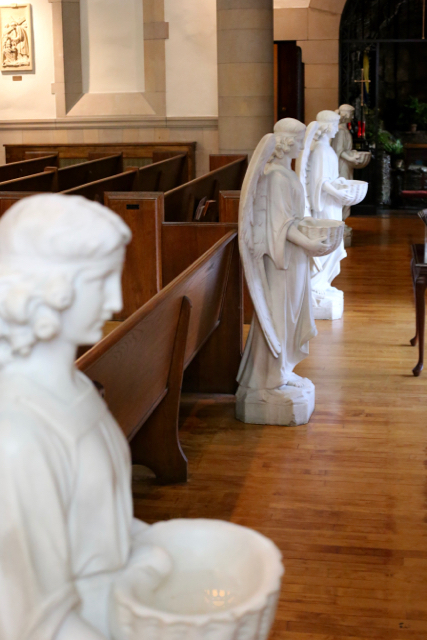 It abounds with older statues, icons and paintings – it serves as a veritable chapel. This is fortunate, since outside of Sundays – and presumably other mass times – the nave of the church is usually closed. There are also some curious things to read. An unexpectedly beautiful metal plaque from 1911 honors the pastor who really created the present parish in the time before the First World War. 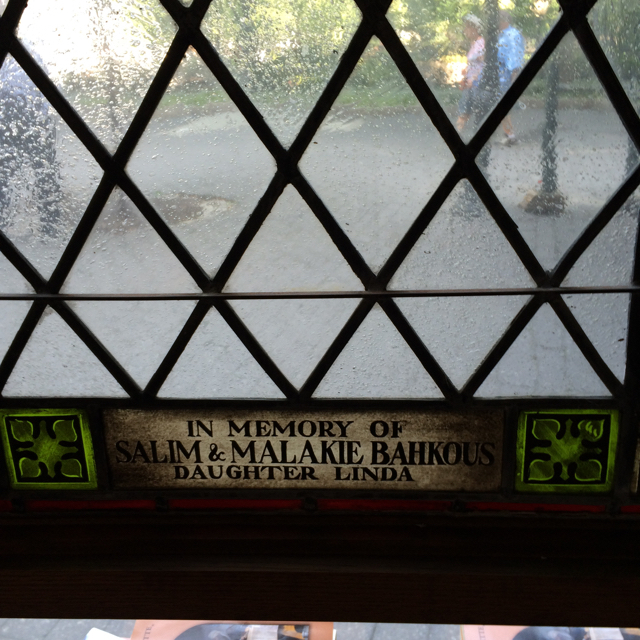 A later plaque commemorates the Requiem Mass celebrated here on July 2, 1909 for the famous actress Helena Modjeska. And then there is a poster in Polish pointing out the occult and satanic significance of certain medallions commonly worn by women today. I think to myself: I am going to like this place…. 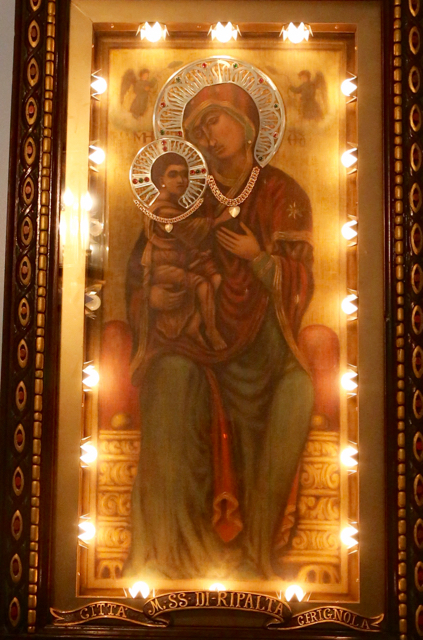 (Above and Below) Art in the vestibule:Our Lady of Czestochowa in a gold frame, an early naive painting of a christening. (Above) Fine plaque commemorating Fr. John Strzelecki, who in essence refounded the parish after 1892 and built the present structures. After the vestibule the nave of the church is somewhat of a disappointment. In its architecture and its dimensions, St. Stanislaus parish is a modest affair. 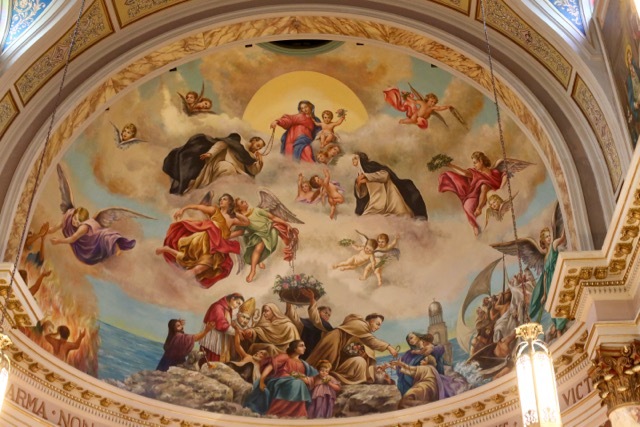 It overflows with images and art from all the different ages of the parish’s life, but seems to have suffered from thoroughgoing modernizations in pre-conciliar times. (Judging from the form of the altar and the green stone sheathing, these restorations probably dates from sometime between the late 1920’s and the 1950’s – probably towards the latter part of that period). 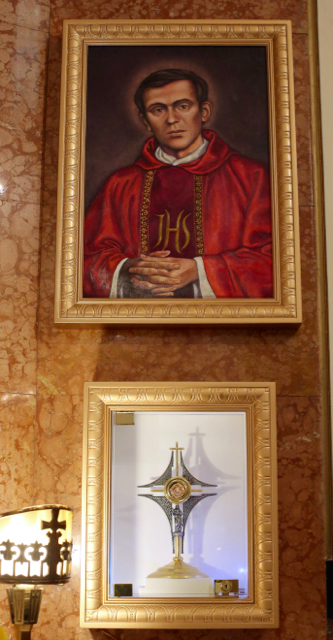 And since then, new devotions and shrines have been added continually: images and relics of Pope John Paul II and Fr. Jerzy Popiełuszko, a shrine of Divine Mercy, etc. It all leaves a mixed impression – a heterogeneous jumble of all kinds of artifacts and styles. 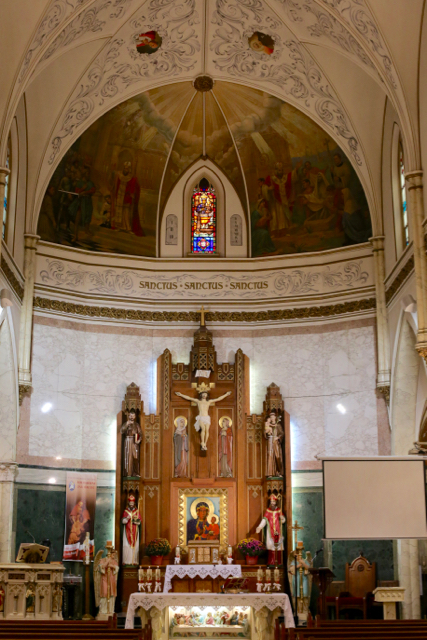 It’s quite a contrast with the lavishly decorated, unrestored Polish parishes I have visited in Chicago, New Haven, Yonkers or Jersey City. Yet everything is in good order well maintained. 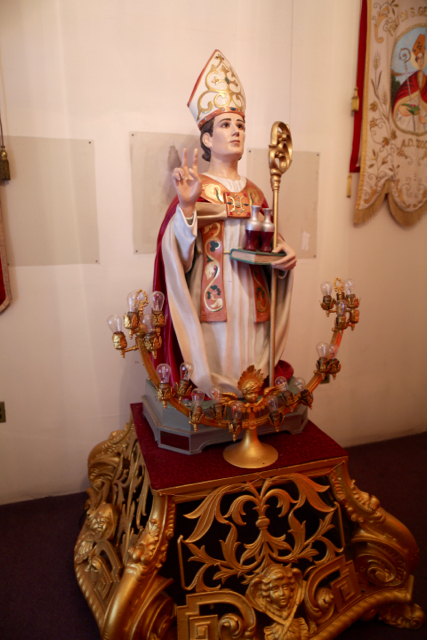 (Above) St. Stanislaus. The figure on the left is wearing armor of a 17th century Polish “winged hussar.” (Below) the wide variety of styles in this church is evident. 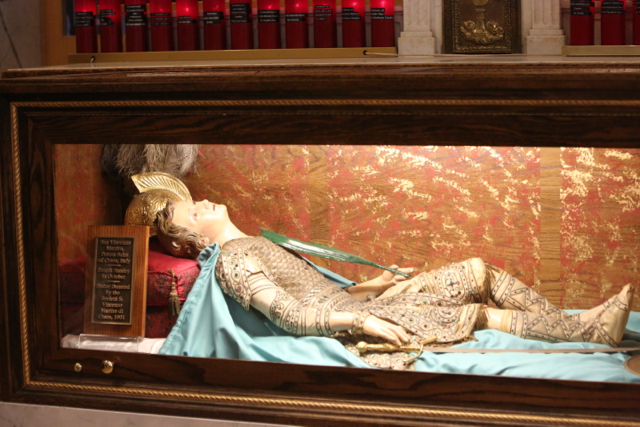 (Above and below) Images and relics of Fr. Jerzy Popiełuszko and Pope John Paul II. In contrast to most other Manhattan churches, this parish obviously still benefits from ongoing immigration. There are several masses celebrated in Polish and English on Sundays and weekdays; the parish still claims 900 registered parishioners. Numerous parish societies – many of them traditional activities and devotions – are still active, just like they did in the “good old days.” 3) On my recent visit the parish priest was announcing a dance social, a fundraising drive to repair the church’s steeple and news on the parish’s Polish school. So there seems to be continuing vitality. 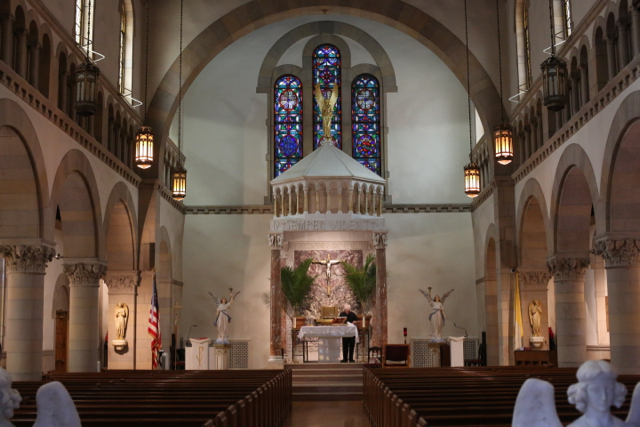 Moreover, the strong national commitment of this parish coexists with an apparent willingness to reach out to the broader community of Catholics and non-Catholics of the neighborhood. 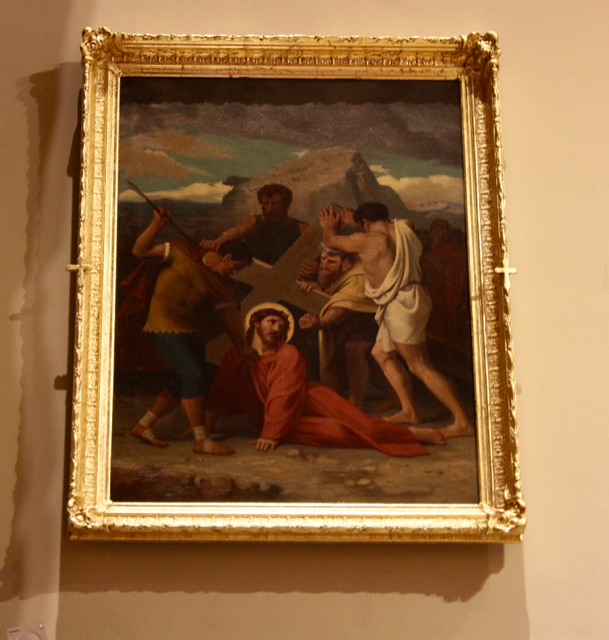 And even if the artistic expression of the new devotions are of uneven aesthetic quality, they nevertheless testify to an ongoing, vital Catholic life. 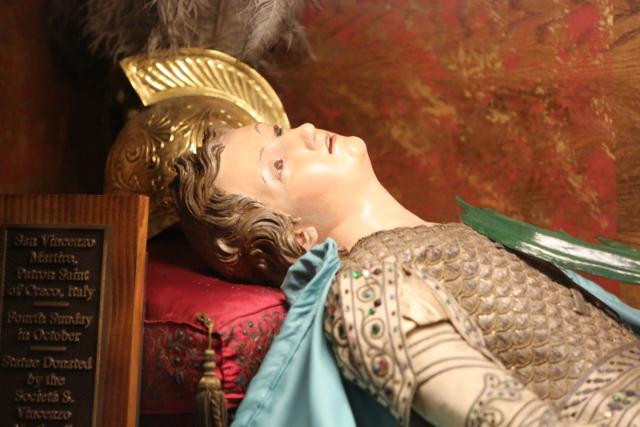 St. Stanislaus parish is no museum! 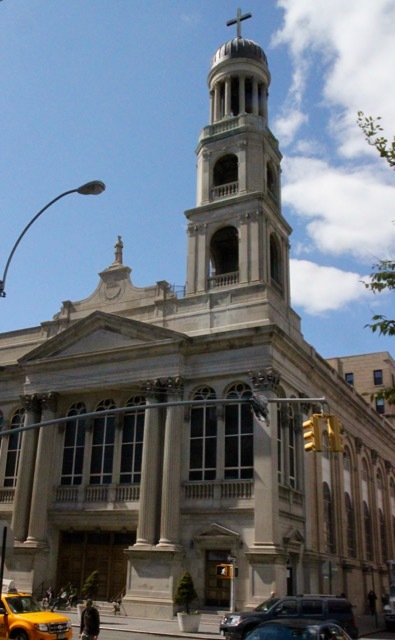 “Hotelier Jeffrey Dagowitz has snapped up three Chelsea properties for $50.4 million, including the Church of St. Vincent de Paul. The former French national parish of New York. Built in 1869, and the witness of many historic events. Closed by the Archdiocese after a heroic struggle over the years by parishioners – who in recent decades were mainly from Haiti and African French-speaking countries. See our description of this church. 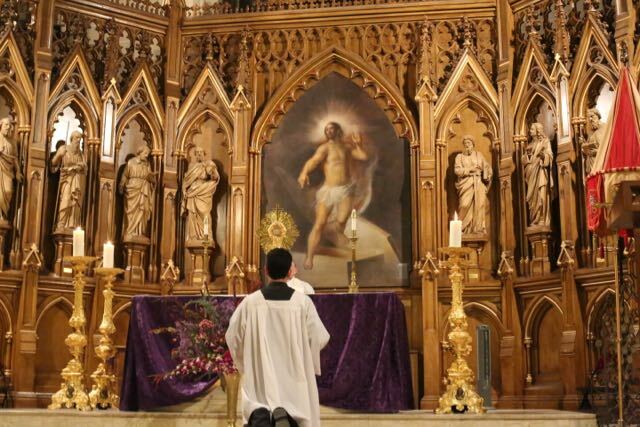 It seems that, in this era, even the smallest New York parishes undertook the most amazing evangelical activity – including both the corporal and spiritual works of mercy. 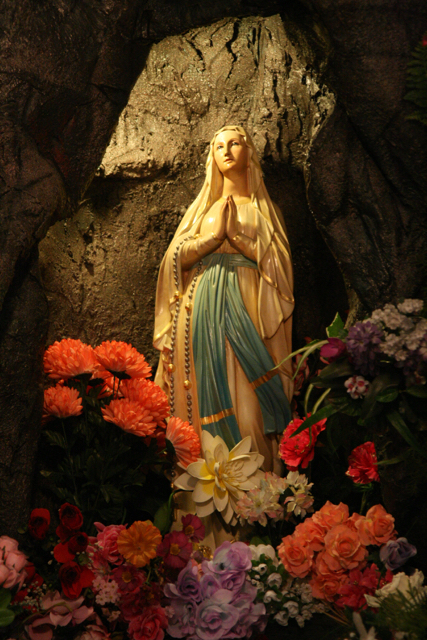 (Above) Image on display at the Seton Shrine Museum. And then came the beatification of Mother Elizabeth Ann Seton in 1963 by Pope John XXIII. America now had its first native born beata. 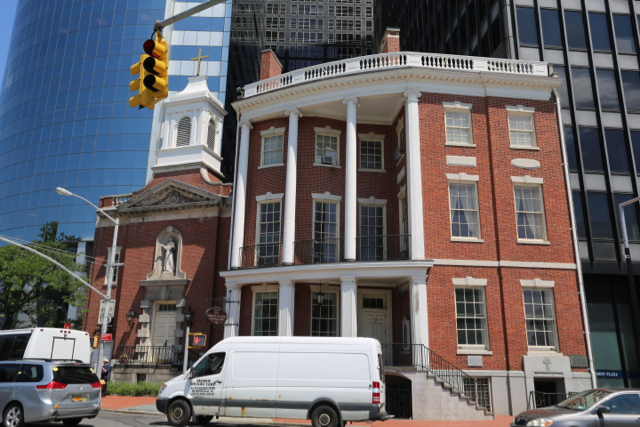 Cardinal Spellman seized the occasion to build a chapel on the site of the building where Mother Seton lived. 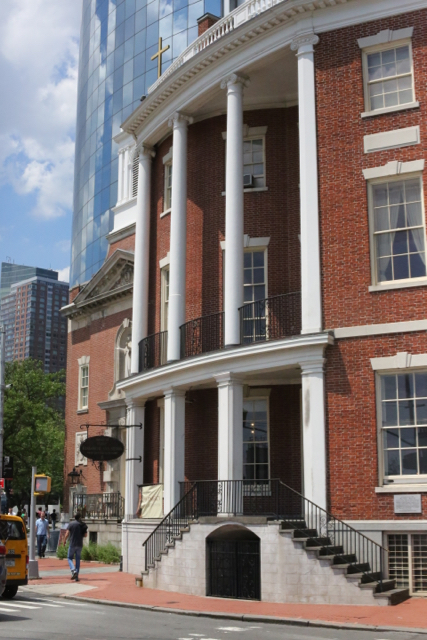 7 State St. was also entirely restored and reconditioned as a part of the new complex. 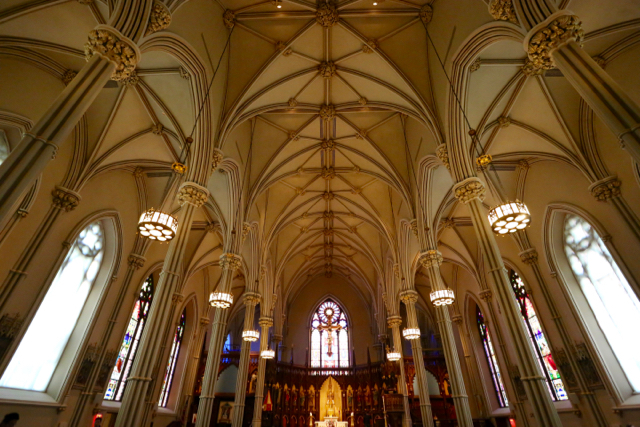 (Above) One of the most recently constructed Catholic churches on Manhattan Island is joined to one of the oldest and most interesting buildings in New York City. (Below) A glance upwards reveals the scale of the neighboring towers that overwhelm Our Lady of the Rosary. 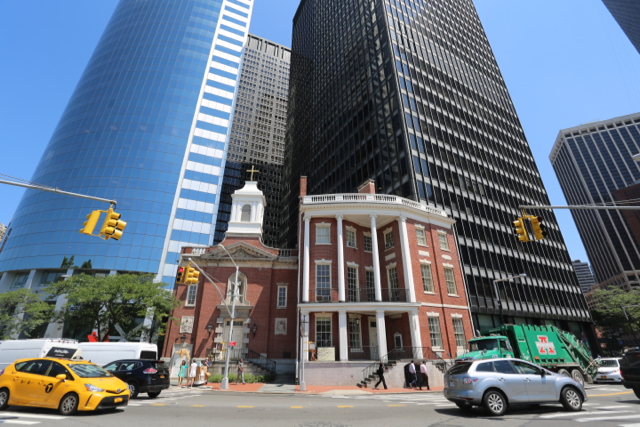 Regarding the 1965 chapel – what might appear to be a monument of the federal era is in fact one of the last parish churches to be built in New York City. Its architecture strikes me as a direct descendant of Corpus Christi parish built some 30 years earlier. As with that church, the adoption of a style associated with 18th century Protestantism does raise questions about the self-understanding of the Church. The interior, at least in its present appearance, is more relentlessly Protestant than its ancestor near Columbia University: no paintings in the style of the Early Italian Renaissance here! Despite the reliance on artificial light, we cannot deny a certain pleasing elegance. Most distinctive is the oval floor plan. 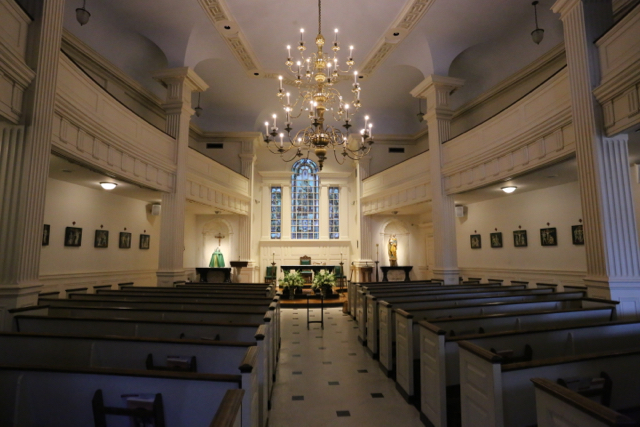 It is stated that this was meant to evoke not just a meeting house, but a ball room of the 18th century – reflecting Mother Seton’s love of dancing. 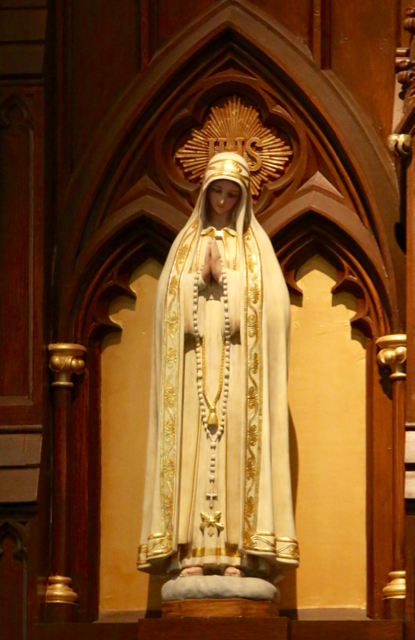 That seems improbable; however, doesn’t the fact that it is repeated show an emerging lack of seriousness about spiritual matters in the “American Catholic Church?” For a shrine, there are just a handful of images to recall to us Mother Seton or Our Lady of the Rosary. 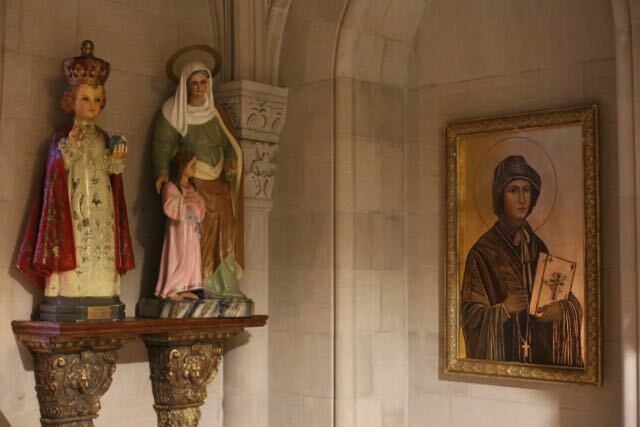 A statue of Mother Seton stands in the rear of the chapel ( in what once was a baptistery? 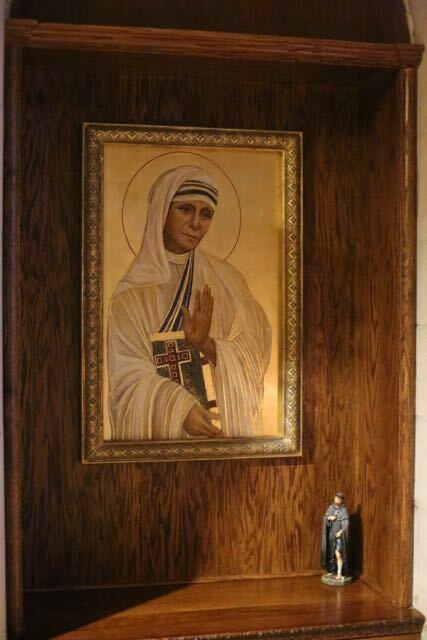 ); a picture of Our Lady of the Rosary is also somewhere back there on a wall. 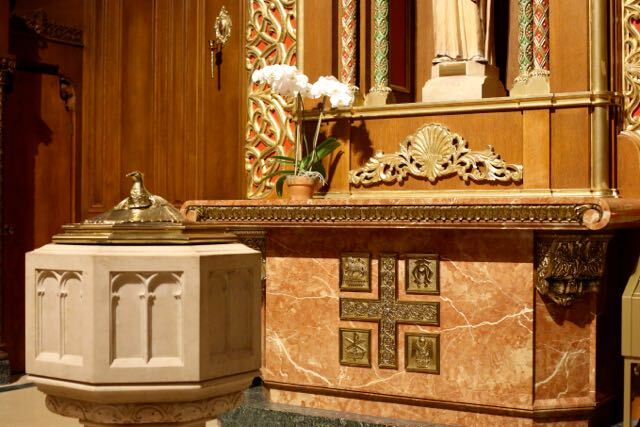 All in all, do we not see here, in Cardinal Spellman’s last Manhattan church, not just a copy of a historical style but a transitional form leading to the style of the Vatican II? 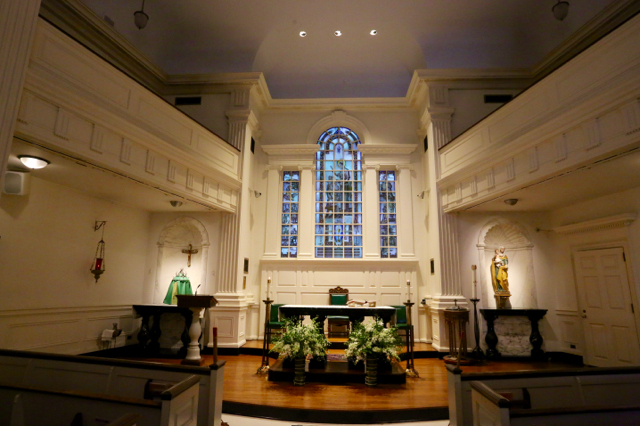 (Above) The shrine of Elizabeth Seton attempts to replicate the style of an 18th century American meeting house – without the clear light provided to such structures by numerous windows. (Below) The oval layout, however, is distinctive and unusual; it seems to respond to the curved facade of 7 State Street. 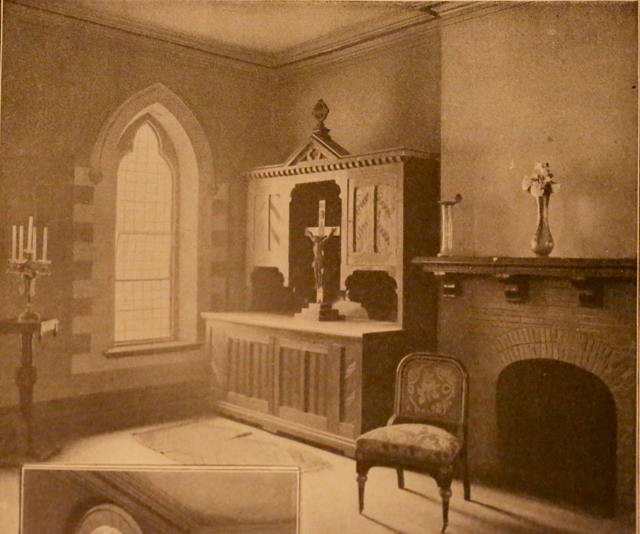 (Above and below) The central portion of the sanctuary – at least in its present form – would have undoubtedly pleased the Calvinist forbears of Elizabeth Seton. 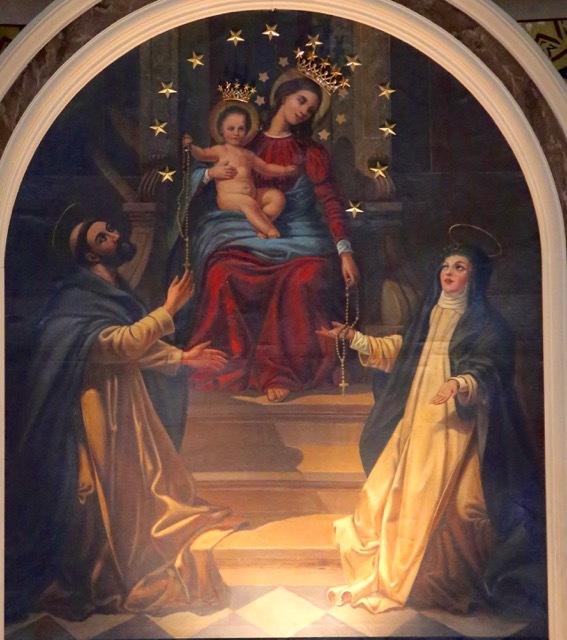 (Above) An old picture of Our Lady of the Rosary in the back of the church. Of course, Elizabeth Ann Seton was later canonized in 1975. But by then, interest in such things was flagging. 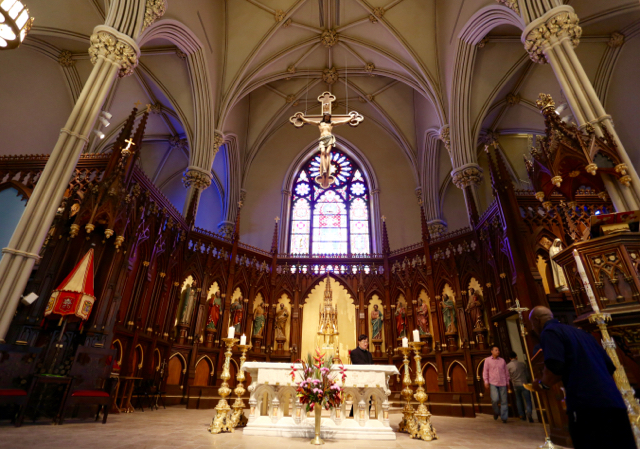 Then, in the last few decades, downtown New York reemerged a a residential area – an extraordinary turn of fortune for Our Lady of the Rosary. It looked like this parish finally might be on the road to a “normal” parish life. 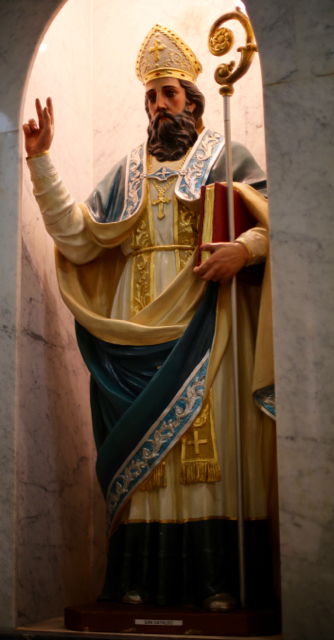 But, in 2015, the parish was nevertheless taken by surprise and merged into St. Peter’s (out of which it had been originally carved)in “Making all Things New.” We shall see how the shrine to New York’s first native born saint fares…. See generally: McDonough. Op. cit. 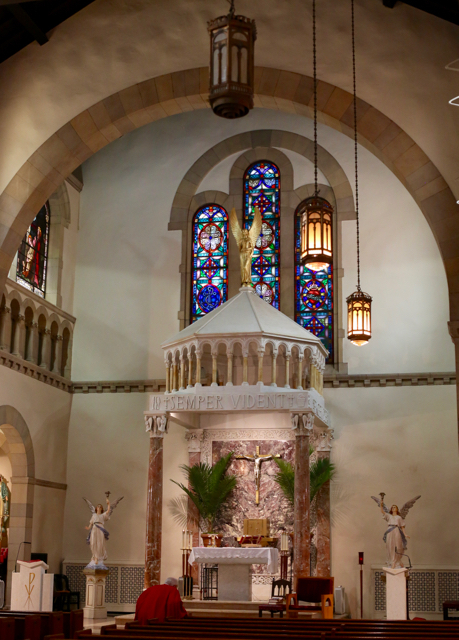 ; McDermott, Peter, “Living Landmark: Parish Preserves 7 State Street which served 120,000,” Irish Echo 2009; Our Lady of the Rosary Parish: Shrine of St. Elizabeth Ann Seton (parish guide). See also the website of the combined parish of St. Peter and Our Lady of the Rosary; Exhibit in the museum of the Shrine. McDonough, Op Cit. at 28. McDonough, Op Cit. at 1-2. 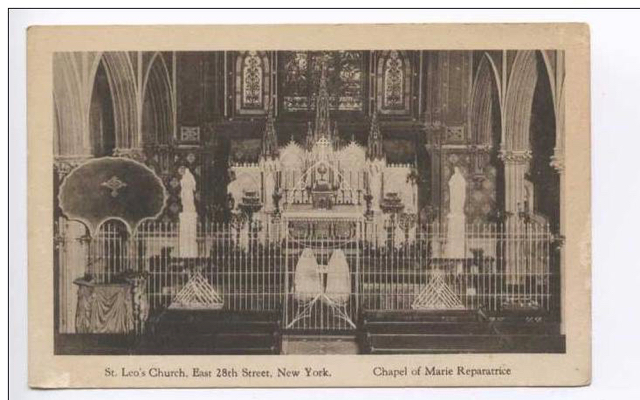 For connoisseurs of New York of churches, St. Leo of East 28th St, founded in 1880 and completed in 1881, has been a tantalizing enigma. 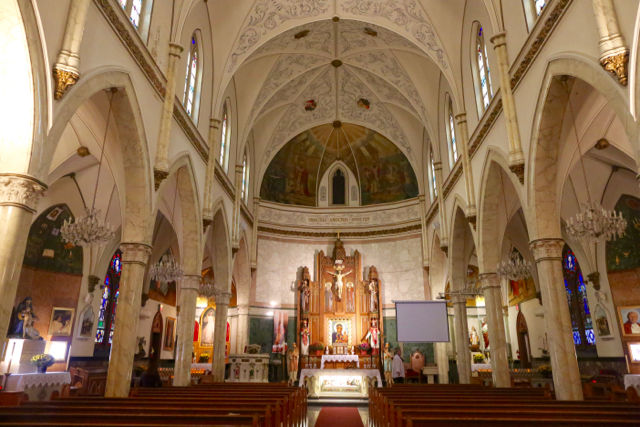 For, seemingly alone among the almost innumerable parishes established in that era, St. Leo’s seems to have “disappeared” not even 30 years after its foundation, despite its location in a originally well-to-do neighborhood. The conventional wisdom is that this was a minor initiative, a kind of chapel associated with one particular priest. After his death, so the story goes, the parish was transformed into a convent and disappeared from public view. Then this convent with the remaining parish buildings in turn vanished in the 1980s. Additional research tells entirely different tale. 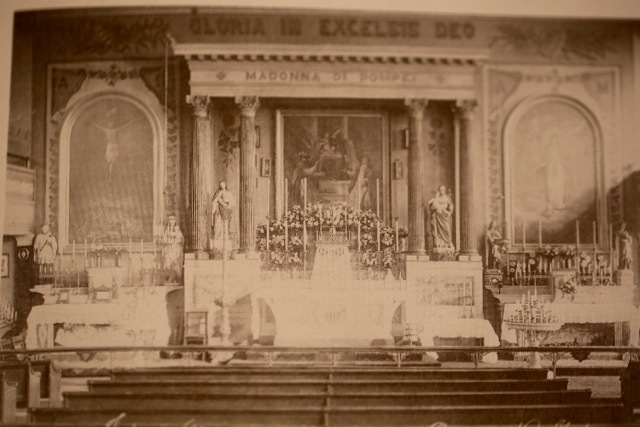 The parish of St. Leo’s enjoyed a citywide and even national reputation around 1900. 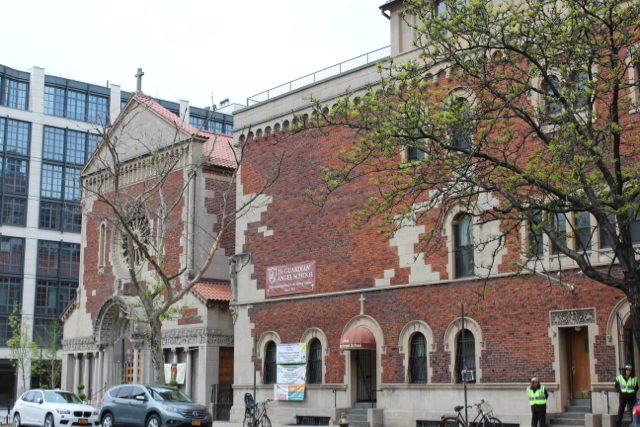 And, after its transformation into a convent in 1909, the public visibility of this church – at least in New York City itself – actually increased. 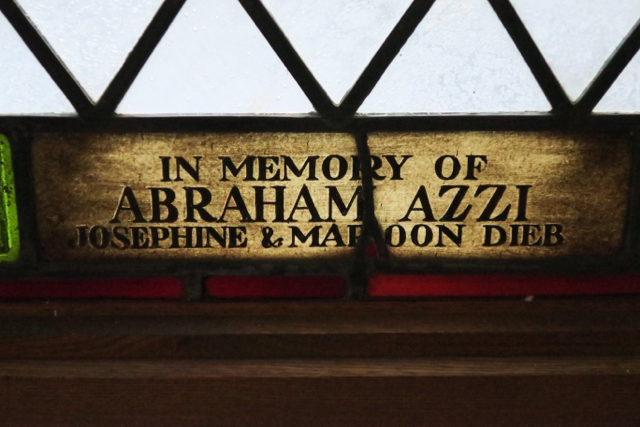 The founding pastor was indeed remarkable in a number of respects. First, he was at ease hobnobbing with the rich and famous. By inheritance he had acquired some personal wealth of his own. It is claimed that the building of St. Leo’s was largely facilitated by Lorenzo Delmonico of the famous restaurateur family (Fr. 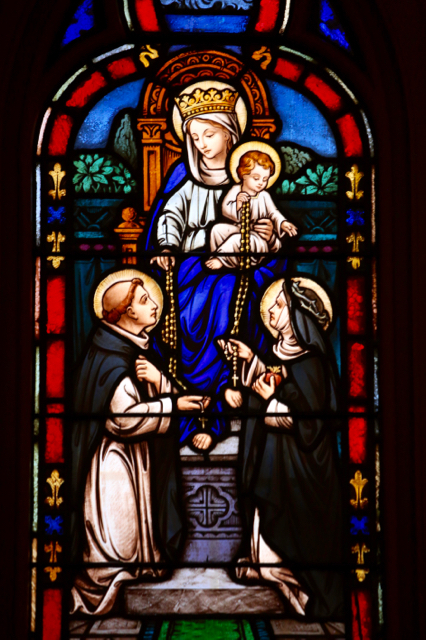 Ducey was a boyhood friend of the family; the Delmonico family was active in the foundation of several other Catholic parishes over the course of many years) 3). Fr. Ducey was a regular at Delmonico’s – the premiere restaurant in New York – and has been described as the house chaplain of the Delmonico family. 4) Within his parish boundaries were numerous wealthy families: the Delmonicos of course, but also the Iselins, Clarence Mackay, John McCormack etc. Fr. Ducey officiated at society marriages and presided at the funerals of the rich and famous. Second, he was a strong advocate of justice for the workingman. This earned him nationwide notoriety. In this he was following some of the views of the redoubtable Fr. 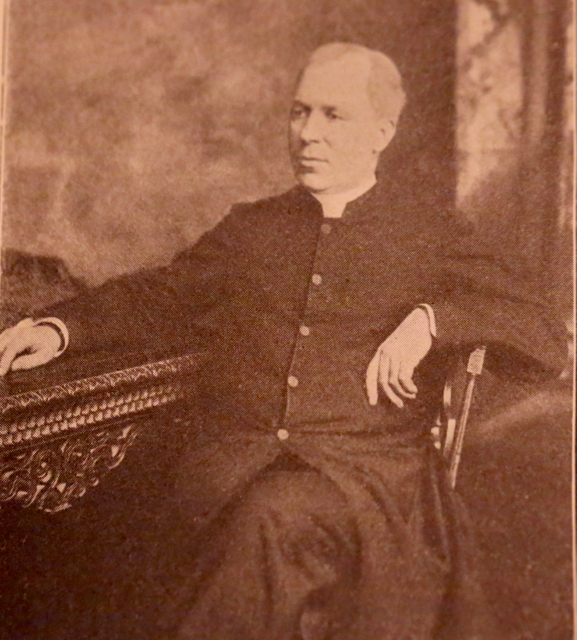 Edward McGlynn, the pastor of neighboring St. Stephen further to the east on E. 28th St. When Fr. 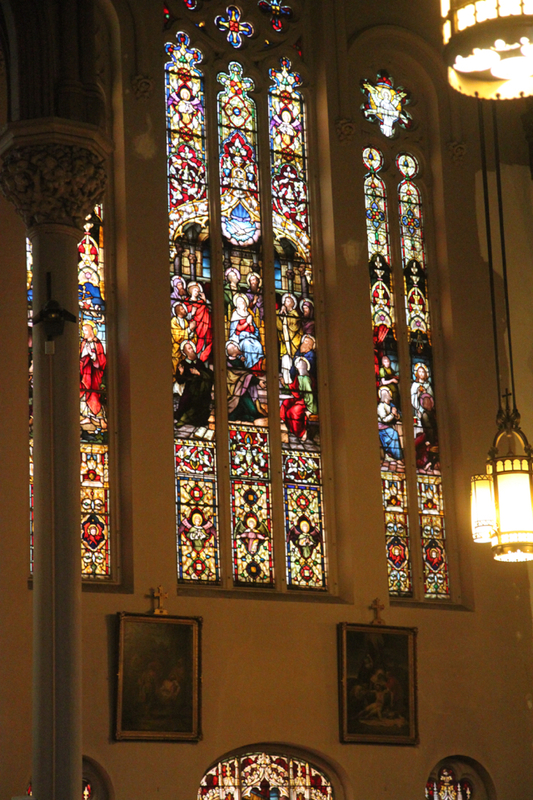 Ducey died on August 22, 1909, he left his not inconsiderable fortune to St. Leo’s parish. But, like so many other parishes at this time, St. Leo’s resident parishioners had largely disappeared. At this moment, however, Providence intervened. (Above) St Leo’s as it appeared in 1899. The large building to the east is typical of how the parish’s neighborhood was being transformed in that era; within a few years it too would be replaced. 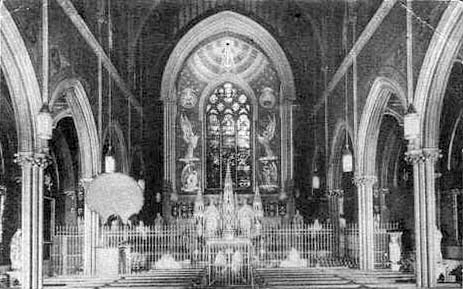 (Below) The interior of St. Leo’s in 1899. I believe the stained glass depicts the encounter of Pope Leo the Great with Attila the Hun which, according to legend, saved Rome. 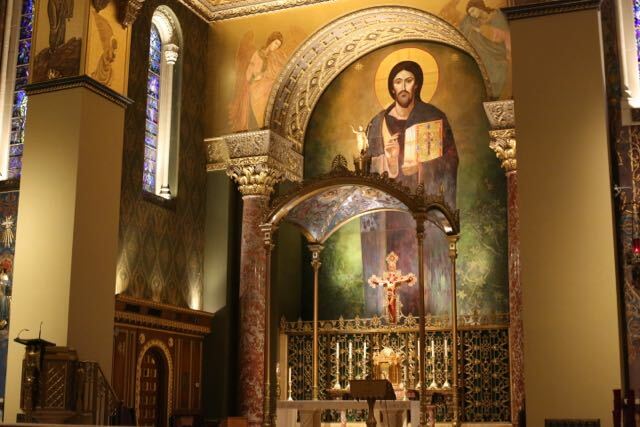 The magnificent furnishings of this church – artistically similar to those of nearby St Stephen’s – demonstrate that for Fr. Ducey too, the creation of a beautiful, unapologetically Catholic church was a necessary element of evangelization. 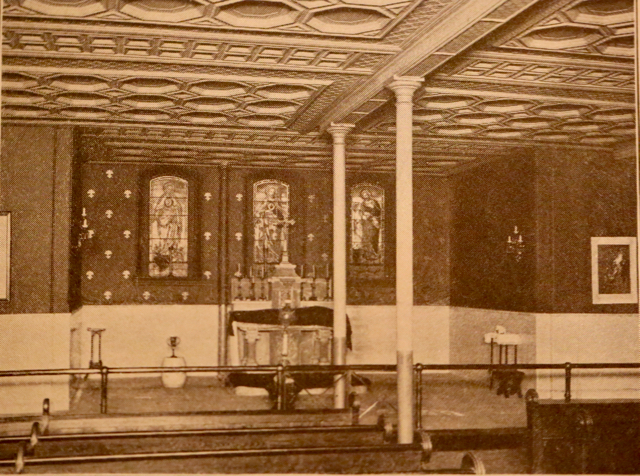 (Above) The lower church of St. Leo’s in 1899. 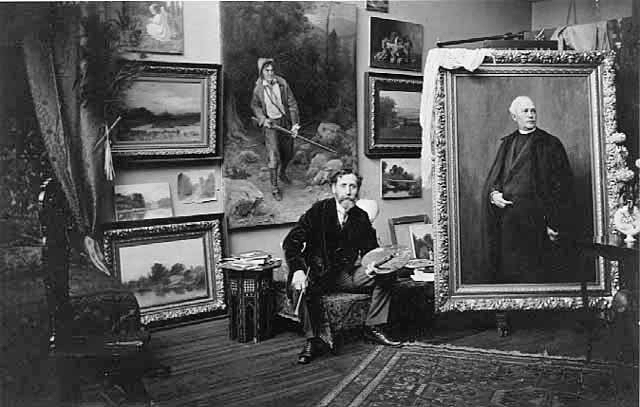 Two views of the “House of Repose” in 1899. (Above) The Robing Room; (Below) the Repose Room itself. We have already covered the many initiatives of the indefatigable Countess Annie Leary. In 1907 she had facilitated the arrival in the United States of three sisters of the order of Marie Reparatrice (or “Mary Reparatrix”). 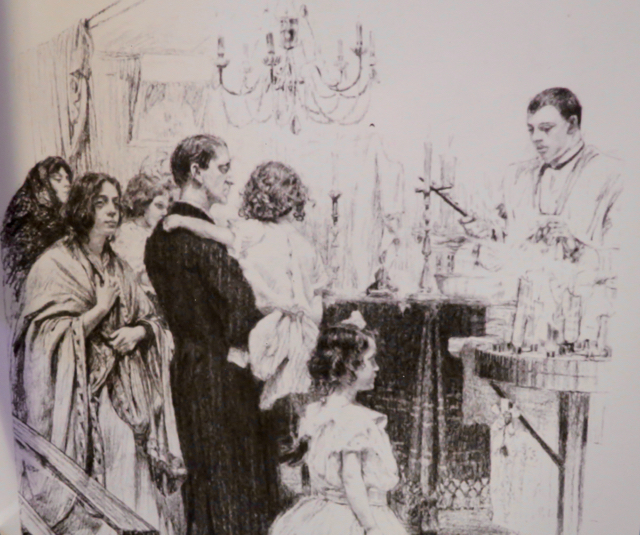 It had been founded in France in the 19th century primarily to offer adoration of the Eucharist. 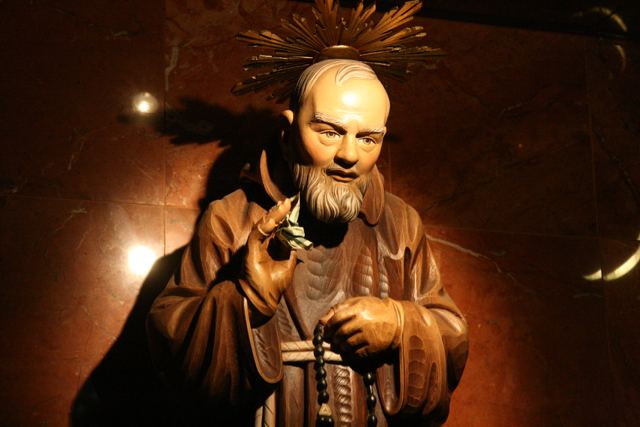 This order combined the contemplative life with certain active apostolates: giving Ignatian retreats to women, providing training to Spanish-speaking people etc. 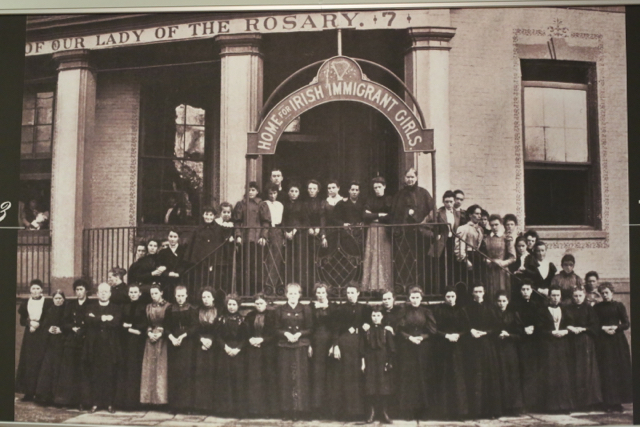 The sisters had a difficult time getting an acceptable permanent residence in New York – it was hard dealing with their domineering benefactress and an initially unenthusiastic Archbishop Farley. But then Thomas H. Kelly, a wealthy man whose wife had connections with the Marie Reparatrice order, wrote to the Archbishop after Fr. 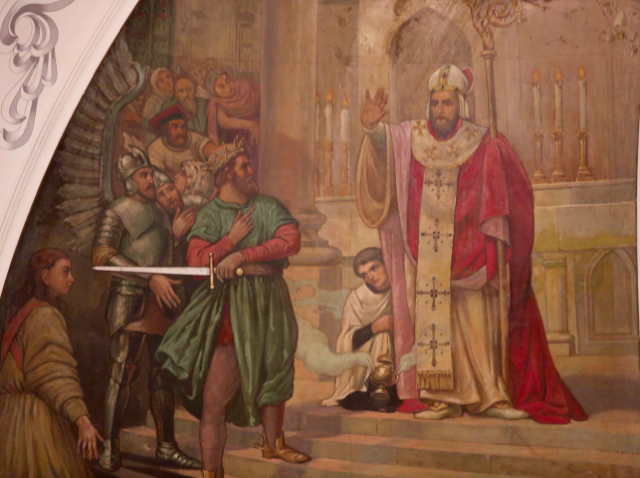 Ducey’s death and offered to finance the establishment of the order at St. Leo’s. On October 2, less than 2 months after Fr. 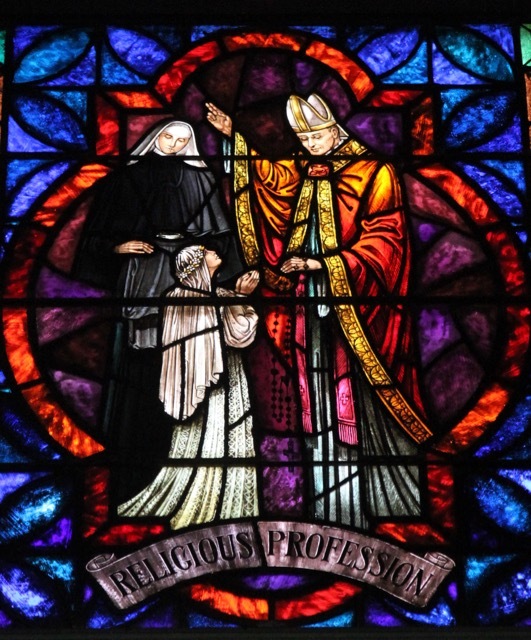 Ducey’s death, Archbishop Farley agreed to cede the church to the sisters. But the archbishop declared himself pastor for a year and would administer the church through his vicars (at some point the clergy of St. Stephen’s took over spiritual affairs of St. Leo’s) Moreover, he retained the Sunday collections for himself to pay off the parish debt and finance repairs structural improvements. 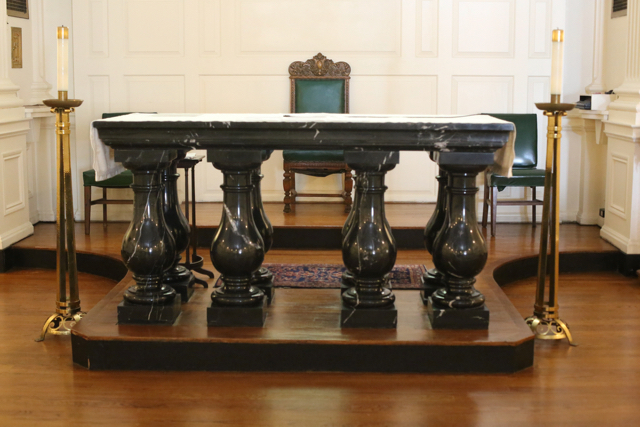 The deed was done and the sisters moved into the rectory of St. Leo’s. 6) A grille was soon added to the church. The connections of this parish with high society were not broken; indeed they seem to have intensified. Early accounts speak admiringly of the alleged high social status of some of the nuns who are also commended for being able to communicate with the representatives of high society. Through the 1940s we hear of a seemingly endless series of fundraising events for the convent involving distinguished members of politics and society. There are numerous references in the contemporary press to the presence of these nuns in New York with their distinctive blue and white habits. It didn’t hurt publicity that the convent was the next-door neighbor of the Seville hotel, prominent in its day. Perhaps most remarkable is a dramatic and romantic 1939 description in The New York Times by Meyer Berger. “Thursday evening services were closing. Held by the gleaming white tapers, by banks of dancing votive candles and row upon row of novena lights that were steady flames in tall ruby lamps we fell thrall to the organ tones, to the clear voiced invisible choir. The music came from somewhere behind us, deep in the church, as from someplace remote…Inside the golden choir enclosure knelt the sisters… the lights from the altar touched all their features with a faint, rosy color. Every one motionless. The scene was one for the brush of some medieval master. Only the soft pealing notes of the organ, the hidden choir’s song after Benediction edged it with life…. Behind us and off to the right a young girl in mourning leaned on the pew rail, eyes steadfast on the altar, rosary beads in white fingers. (After the benediction) We sat for a long time held by the spell. 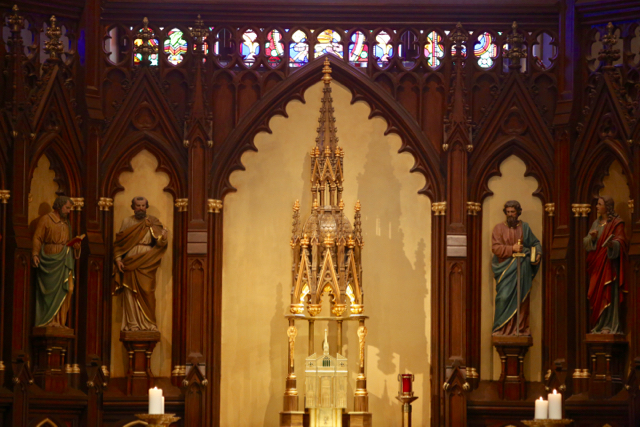 We knew the soft highlights in the altar frame. We stared upon the altar’s whiteness till it blurred; until the tapers’ gleam shifted or seemed to shift. No sound intruded here. This might have been a dream. 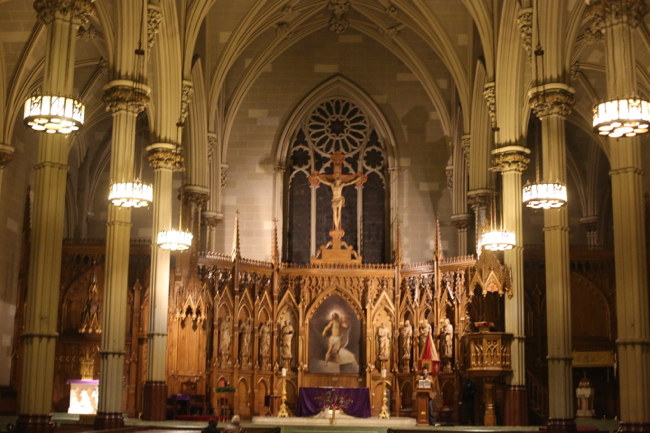 It seems incredible to our ears: Eucharistic Adoration as a citywide and ecumenical attraction. But so it seems to have been. 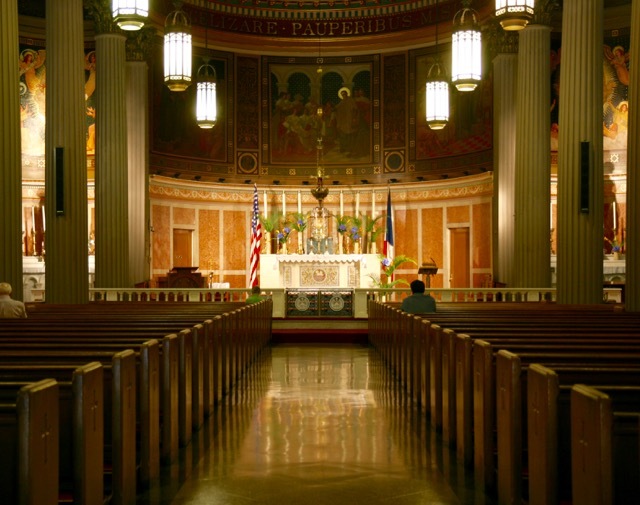 Would the church in New York have prospered more if she had had more such places of silent contemplation? The seemingly thriving church of that time was rich in priests and laity of the active life. But there was only one contemplative order in Manhattan – and even the sisters of Mary Reparatrix were really “semi-enclosed”. 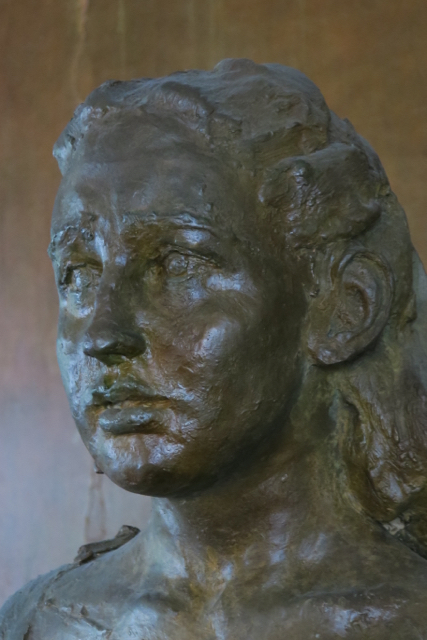 By 1939, Meyer Berger informs us, there were 36 sisters at St. Leo’s. 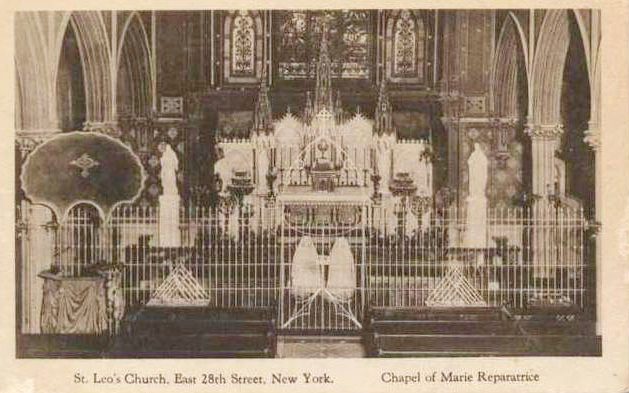 (Above ) A later view of the sanctuary of St. Leo’s, now furnished with a grille for the sisters of Marie Reparatrice. 10) (Below) This photograph, showing two nuns in adoration before the Eucharist, must have been widely disseminated – the version below is of a postcard recently auctioned off in France. 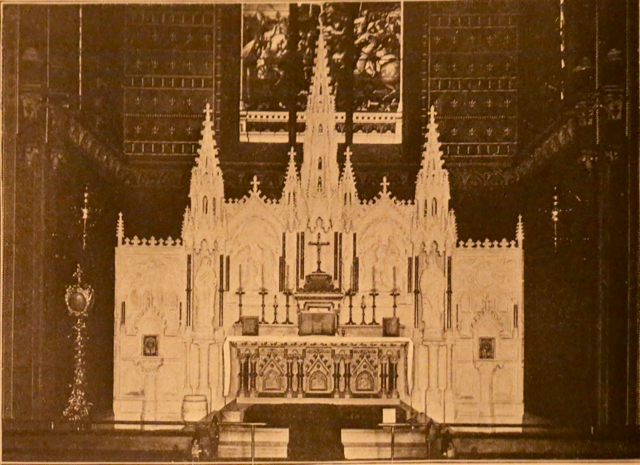 It also shows much more elaborate stenciling and painting of the altar compared to 1899. The buildings were razed in 1985. But a deal with a developer fell through and the property could only be sold in 1997 – for $15 million,. 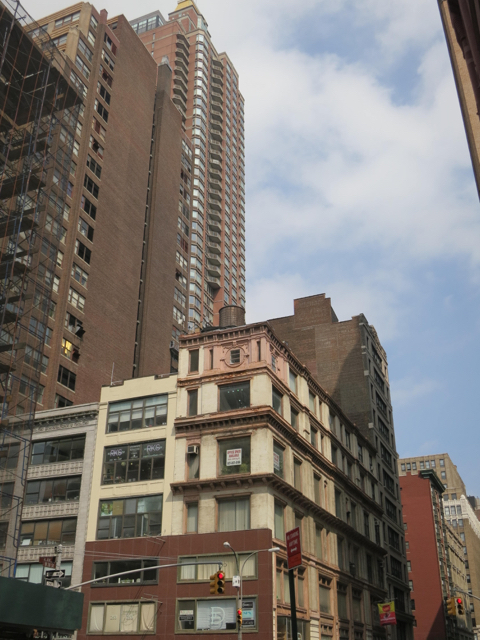 An enormous, 48 story apartment building and its courtyard now occupy the site of the St. Leo property. 12) Yet, is this not a further example how the Catholic Church leaves its mark on the City – but now in an entirely negative sense? 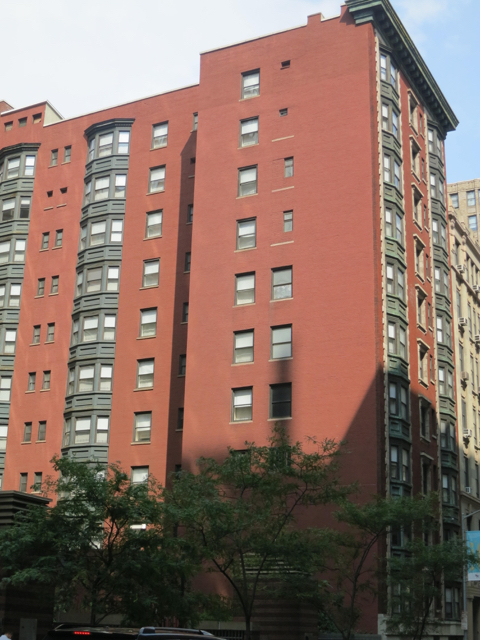 For it was the order of sisters, focused like the developers purely on financial return, that made possible the building of an entirely out of scale apartment building, which completely dominates the neighborhood. 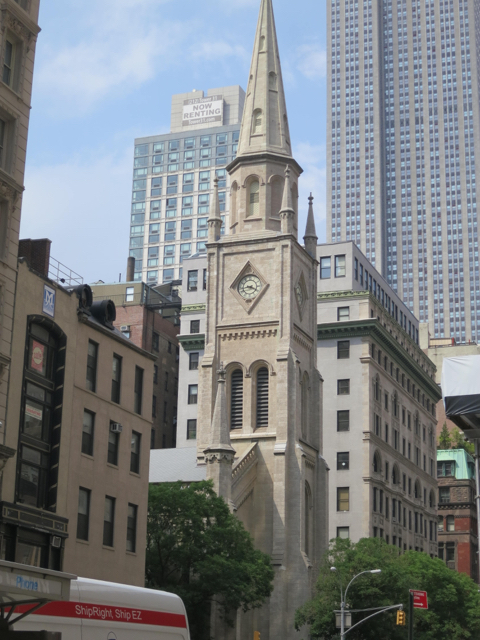 So the Anglican “Little Church around the Corner” and Marble Collegiate Church (where Dr. Norman Vincent Peale sounded off for decades) still remain; the Catholic member of this “Trinity” has disappeared. Decades of public Catholic witness had come to an inglorious end. (Above) St Leo’s today: the grossly disproportionate building in the left background occupies the site of St. Leo’s church and the later convent. 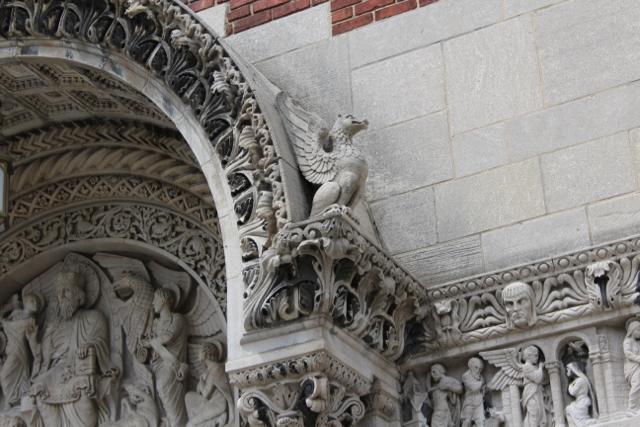 (Above) To help New Yorkers get oriented: the nearby Marble Collegiate Church on Fifth Avenue and E. 29th Street. In the background to the north the Empire State Building towers; in Fr. Ducey’s day this was the site of the Hotel Waldorf-Astoria. (Above) The courtyard is the site of St. Leo’s church. (Above) Overlooking this courtyard to the east is an annex of the old Seville hotel built already in 1906 during Father Ducey’s time. 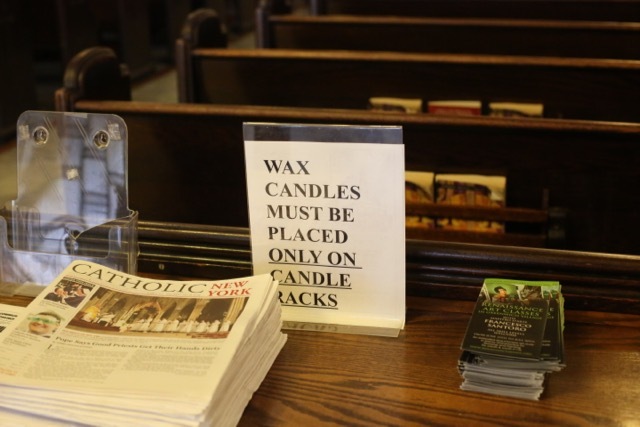 I can’t resist this picture of an ancient notice in the church of the Transfiguration: How many visitors today pay attention to the admonition in this church – or, for that matter, in many Roman Catholic ones? 2. 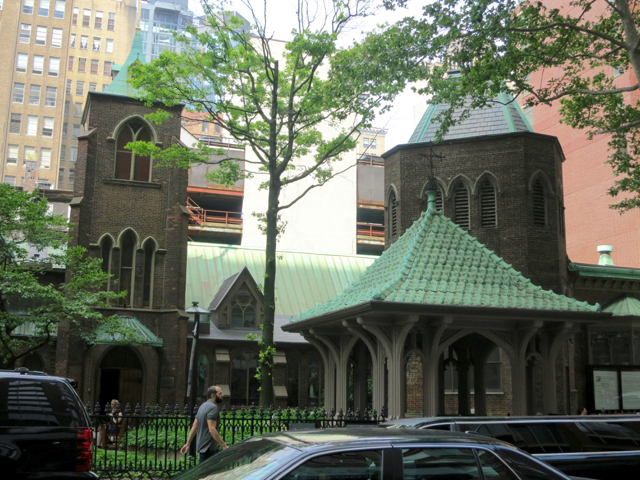 On the construction of St Leo’s see generally: The Lost St. Leo’s Church – No 12 East 28th Street (July 24, 2014). 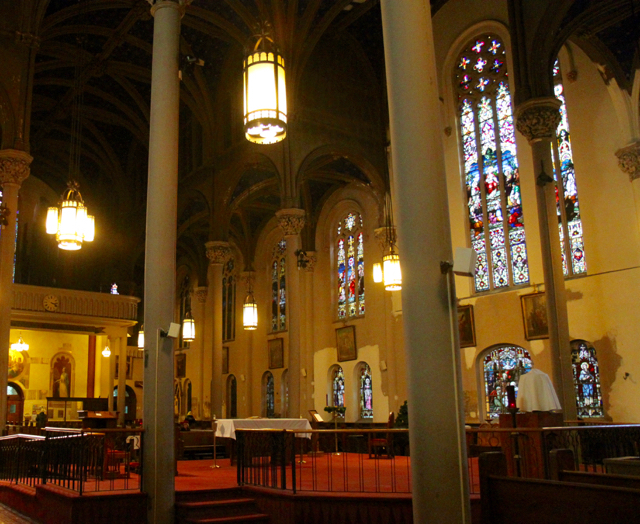 http://daytoninmanhattan.blogspot.com/2014/07/the-lost-st-leos-church-no-12-east-28th.html. The author includes other photographs and curious anecdotes of the history of the church. 3. Thomas, Lately; Delmonico’s: a Century of Splendor at 173 (Boston, Houghton Mifflin Company, 1967). 4. Thomas, Op. Cit. at 219. 8. NOVENA FOR PEACE IS STARTED HERE; Nuns Begin Nine-Day Vigil With Solemn High Mass at St. Leo’s Church; The New York Times (June 23, 1940). 10. 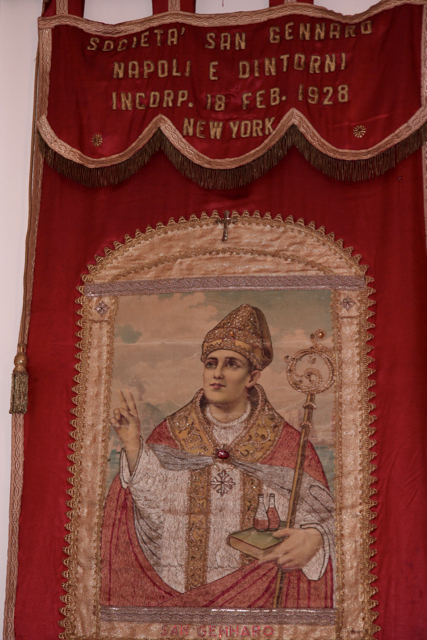 Collection of the Museum of the City of New York from “The Lost St. Leo’s Church” supra. 13. “Mary Piancone, Mother Mary of the Blessed Sacrament 1930-1994, at 160-161. 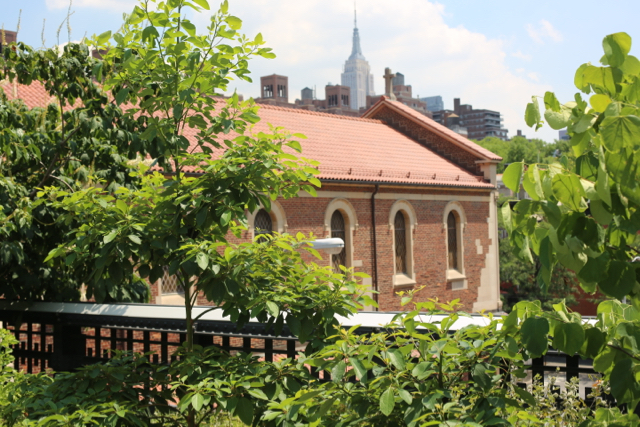 The Churches of New York LXXX: One Block from the Docks – and right on the High Line! Few areas of the city have seen such twists and turns of fortune as Chelsea. It began as an upper income area, with rows of stately townhouses erected in the 1840’s and 50’s. But almost from this neighborhood’s beginnings, industry, shipping and commercial development took off as well. West Chelsea became a center of the maritime industry. Up to 1935 the main piers for luxury passenger ships were located here. Yet, unlike most of Hell’s Kitchen to the north, Chelsea was never depopulated or reduced to a purely commercial landscape. The 1939 WPA guide to New York City spoke of its “preserved” character. 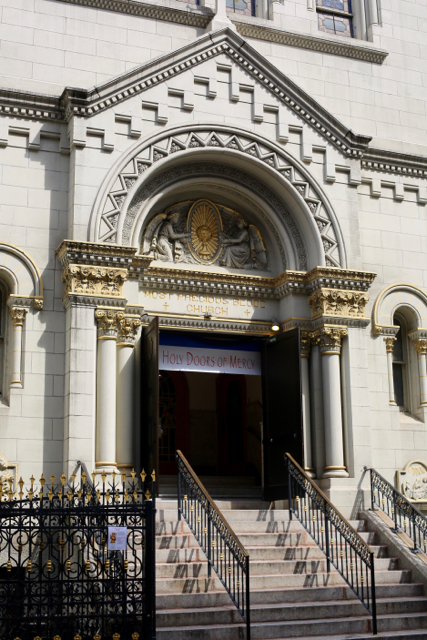 The spiritual needs of the longshoremen and other workers in the maritime trades led to the founding of Guardian Angel parish in 1888. 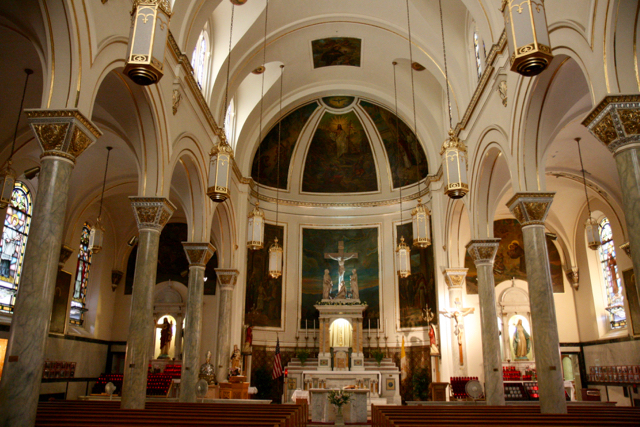 In this respect, the parish is similar to several others on the far West Side: St Veronica in the Village and the original church of St. Cyril and Methodius also originated as “waterfront churches,” while several other parishes on this side of town acquired that character as well. And, years later, didn’t Fr. John M. Corridan SJ, the model of the priest in On the Waterfront, work out of the nearby Xavier Labor School? 1). Like most (but not all) of these churches, the congregation of Guardian Angel was overwhelmingly Irish. The original church was replaced in 1910. And in 1911 a parochial school was opened. 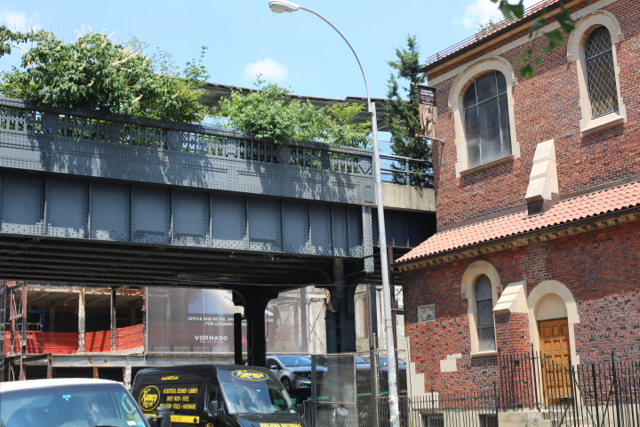 Then came this parish’s first encounter with what later became known as the “High Line”: the New York Central Railroad wanted to relocate its tracks leading to the factories and warehouses of West Chelsea to a new, elevated line. 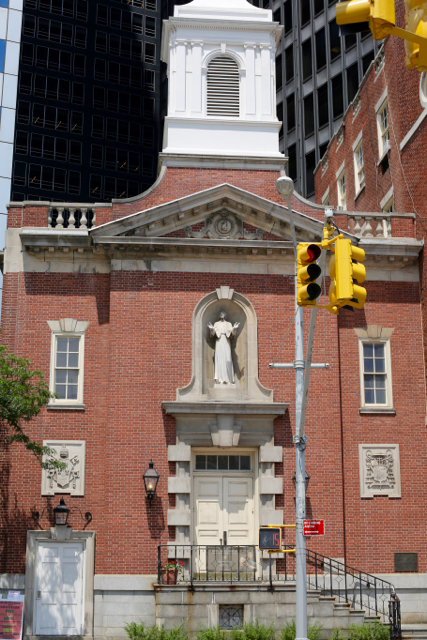 Old Guardian Angel parish, at 511 West 23rd Street west of Tenth Avenue, was squarely in the way. In exchange for this property, the railroad transferred land and cash to the parish to enable a brand new church and school to be built; they both opened in 1931. 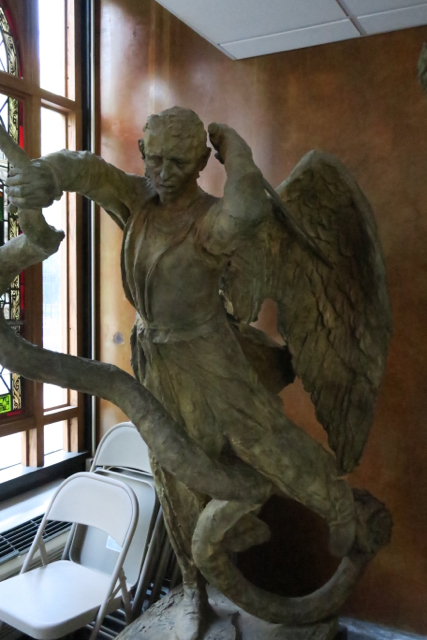 So Guardian Angel, like St Michael’s in Hell’s Kitchen or Our Lady of Pompeii, obtained a grand new building due to the relentless development of the city’s transportation system. 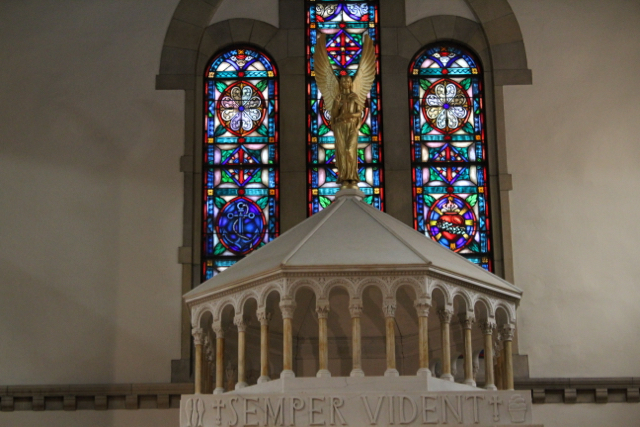 Guardian Angel testifies to the high standards of Catholic Church architecture around 1930. The exterior gives a convincing impression of a southern Italian Romanesque church. The parish claims specific inspiration in the cathedral of Bitonto in Apulia. 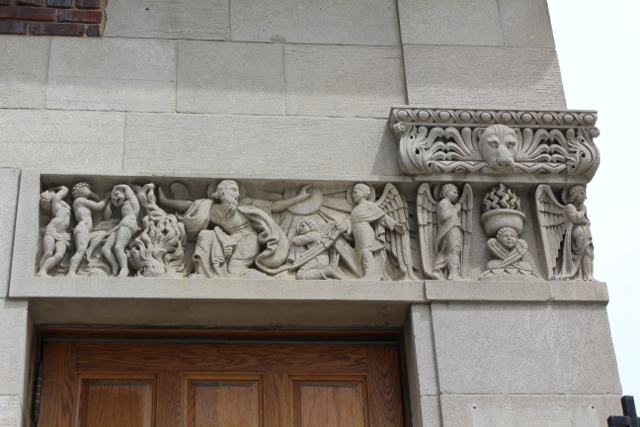 2) Most interesting are the extensive carvings and reliefs surrounding the main entrance and the lengthy frieze extending around the church. In fact, the exterior is more elaborately decorated than the interior. The interior is a simple space, modest in scale, yet seemingly spacious and of great harmony. In contrast to the extravagant decor of van Pelt’s earlier Slovak ethnic church of Saint John Nepomucene, decoration is reduced to a minimum. 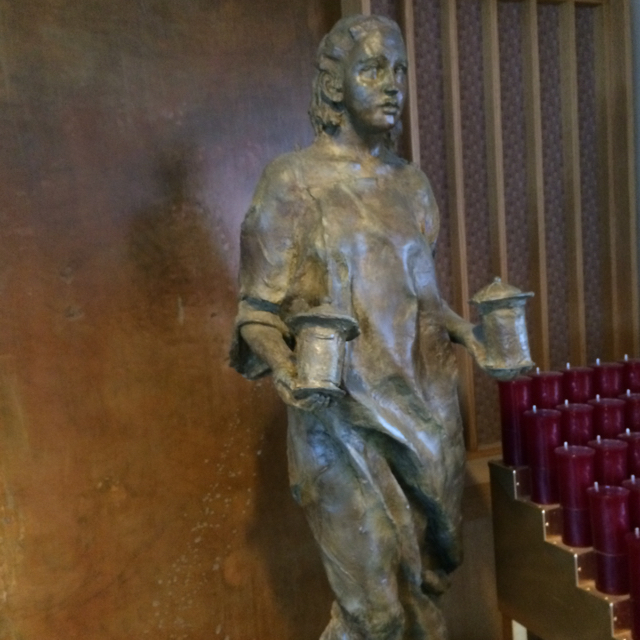 While some of this is undoubtedly due to a post conciliar clearing out of the sanctuary and to the lack of financial resources at this parish, do we not also detect a hint of modern ideas of simplification and stylization? 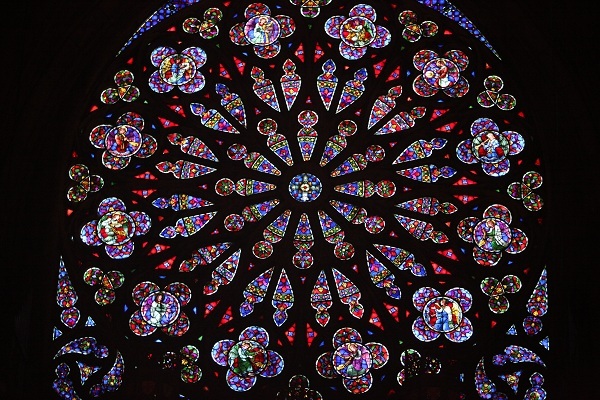 Except for a window that undoubtedly came from the predecessor church, the stained glass is all non-figurative or illustrates symbols of various kinds. 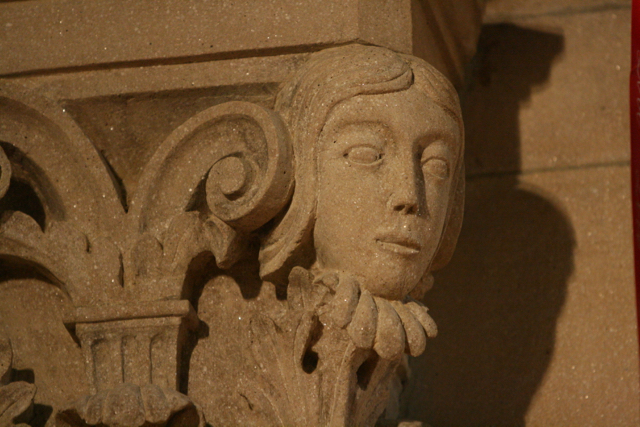 Sculpture is mostly limited to the expressive capitals of the columns. 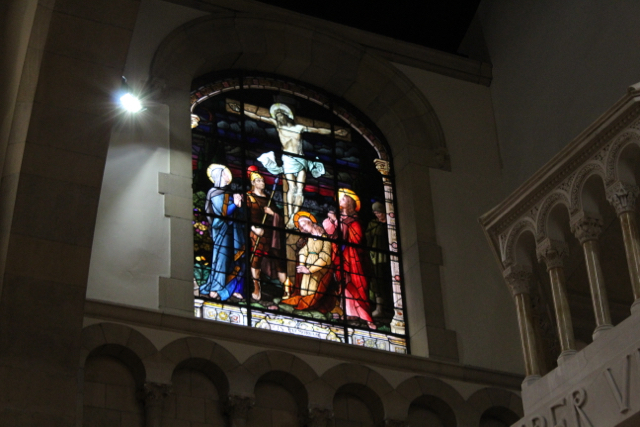 The stained glass windows allow a clear but subdued illumination. Today, the inside of this church is a quiet refuge from the nearby summer touristic frenzy – I don’t know if this was the case long ago when the trains were rumbling by on the active railroad viaduct. All in all both the interior and exterior of this church are amazingly successful aesthetically; much more so then some more celebrated buildings of that era like the church of Corpus Christi parish. 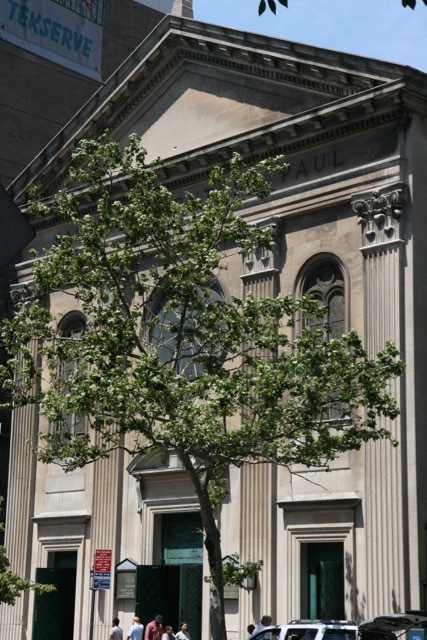 (above) The architect, John van Pelt, created here in 1931 a smaller version of his earlier Manhattan church of St. John Nepomucene in Yorkville. As in that church, the irregular surface of the facade in brick and stone is intended to suggest the weathering of the ages. The style is the Southern Italian romanesque – the parish claims specific inspiration by the cathedral of Bitonto near Bari in Apulia. (Above) The church and, to the right, the still functioning parochial school – built in the same style. 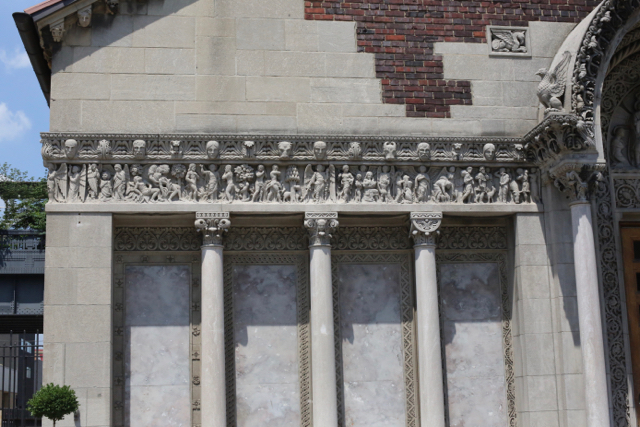 Most impressive is the abundance of carved details on the facade and on the capitals inside. 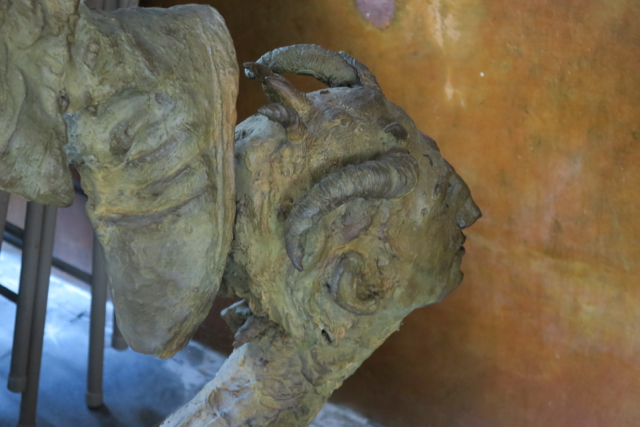 Scenes from the bible, monsters, angels, rows of heads all executed in a convincing neo-romanesque style – do we not even detect hints of then – contemporary art deco at places like Rockefeller Center? 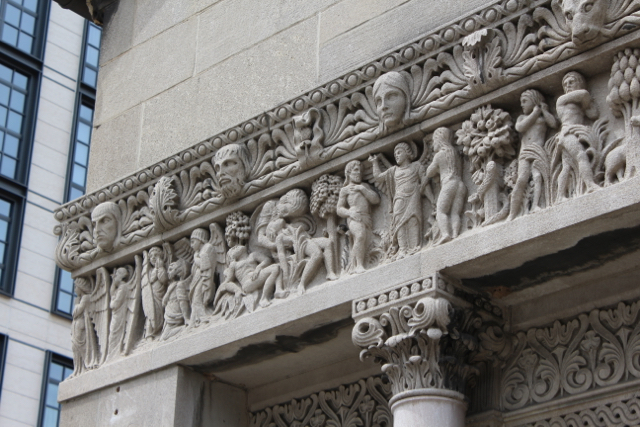 As in the case of van Pelt’s St John Nepomucene, the care lavished on a relatively minor parish church testifies to the extraordinarily high standard of Catholic church architecture and art in the 1920’s and 30’s. Angels! 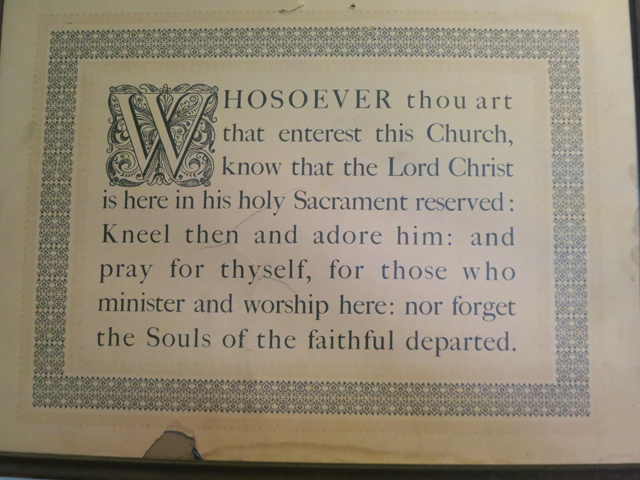 (Above) From an altar in the pre-1930 church? 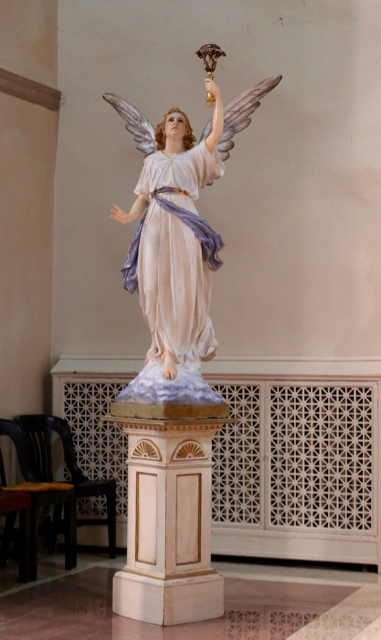 (Below) Older New York churches often feature one or two statues of angels bearing holy water fonts; this church has four. 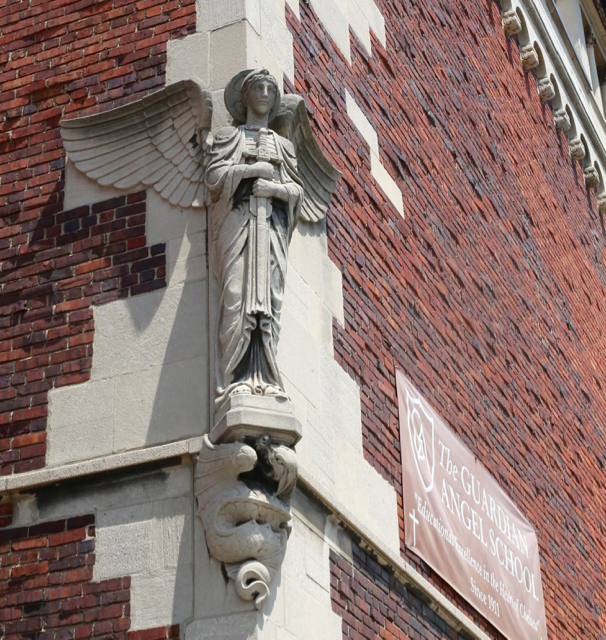 More Angels: (Above) On the facade of the school. (Below) On the Art Deco baldacchino. 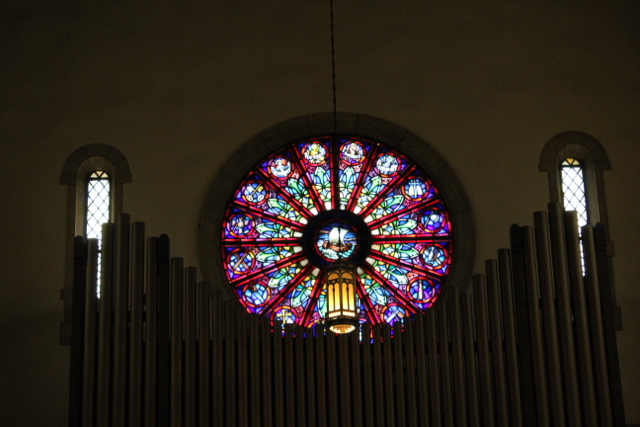 (Above) The central roundel of the rose window of the facade is about the only reminder of this parish’s once prominent role in the maritime community. 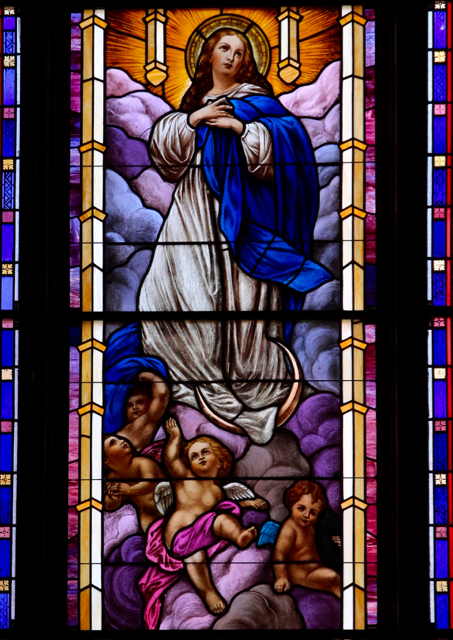 (Below) This window in the sanctuary, in an older figurative style, appears to have been inherited from the church that preceded the present building. 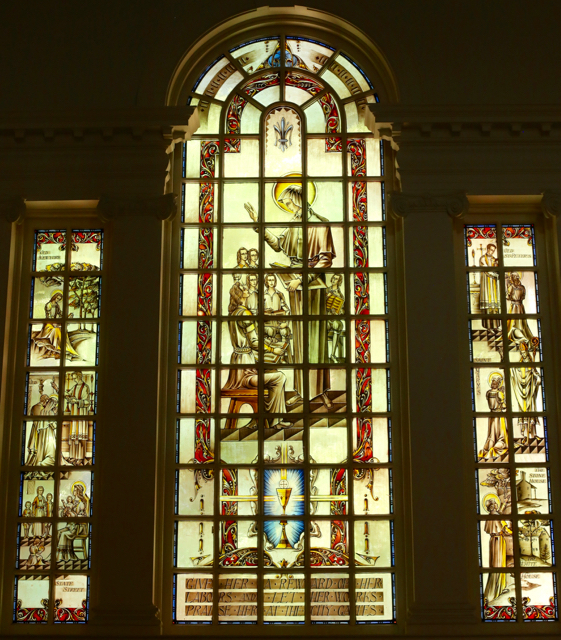 The glass in the 1931 church is otherwise non-figurative or symbolic. 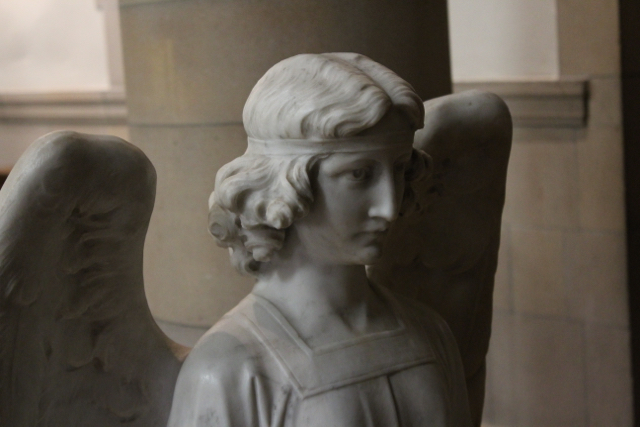 Now Guardian Angel, although a parish of relatively modest size (for that era! ), was not merely one more local territorial parish for longshoremen. 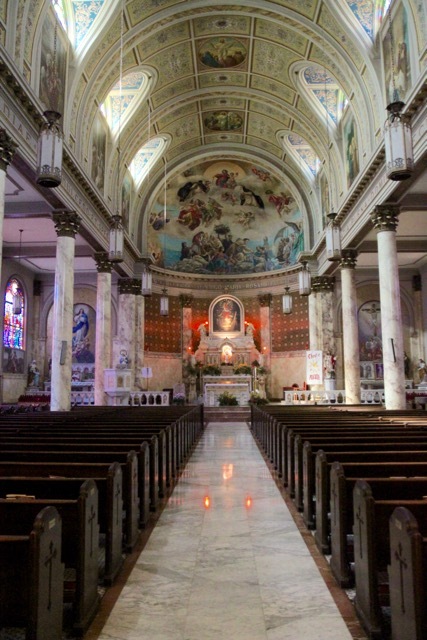 It was the “Shrine Church of the Sea,” the headquarters of the Archdiocesan chaplain to the Port of New York and, under Cardinal Spellman, it was proclaimed the “Seaman’s Church.” Guardian Angel exercised a highly visible citywide mission in the decades after the completion of the new church. The following year Cardinal Spellman died. Those years, actually so recent, now seem like a far off dream. The rows of piers on the Hudson, which in the early 1960’s still formed such a grand sight from the elevated West Side highway, had started to disappear by the end of that decade. The death of passenger liner travel, the development of container transportation and the general decline of New York City industrial life all brought an end to the saga of the Manhattan waterfront. By the 1980s, except for a few piers for cruise ships, the maritime life virtually synonymous with New York City since its beginnings in the 17th century had entirely disappeared. Simultaneously in Chelsea the factories and warehouses near the docks largely closed, the elevated train line ceased operation and gradually fell into ruin. The streets on the far west side of Chelsea near Guardian Angel became at night one of the spookiest parts of Manhattan. By the middle of the 1980’s the only relic of the glorious past that remained was the metal plaque on the façade of the church still proclaiming it to be the home of the chaplain of the port of New York. 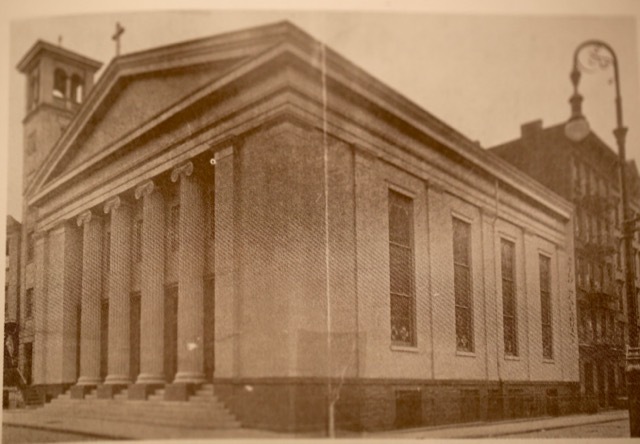 A post World War II influx of immigrants from Puerto Rico was in large part responsible for maintaining the congregations of the Chelsea parishes. But already the rest of Chelsea had started an economic turnaround; it was one of the first areas of the city to experience gentrification – a process continuing to the present day. 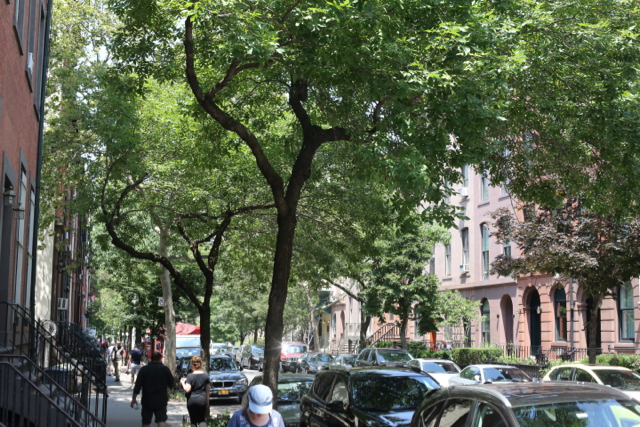 Many were attracted by its old-fashioned townhouses and low rise streetscapes. 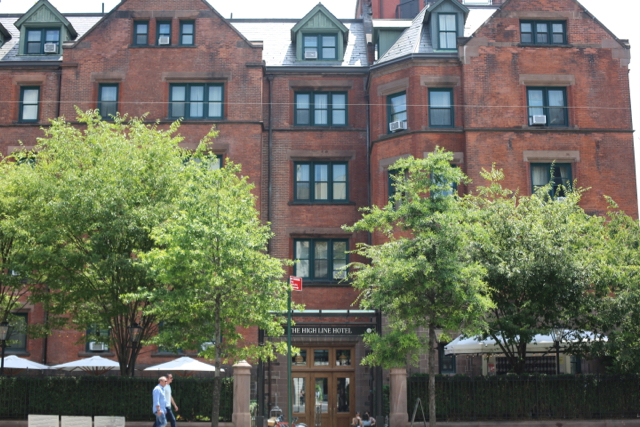 Then, Chelsea succeeded Greenwich Village as the center of New York homosexual life. Remaining piers were converted into sports and leisure facilities. The meatpacking district at the southern end of Chelsea was similarly transformed from an industrial and commercial area to a region of boutiques and restaurants. Finally the long ruined and abandoned viaduct of the railroad was transformed into the High Line: an elevated park. 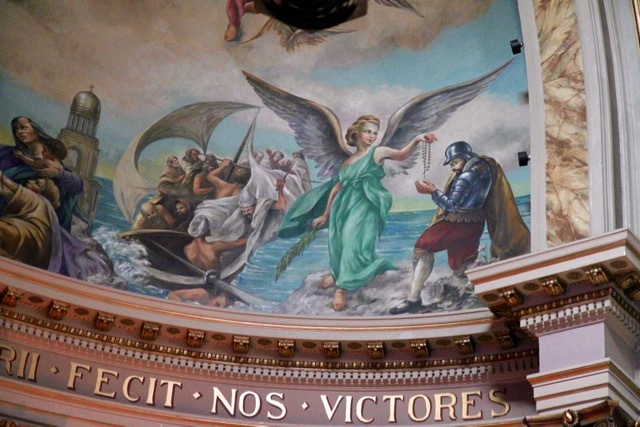 Guardian Angel parish now found itself in a center of international tourism. Where once poor longshoreman had lived and struggled to make a living, there were now multi-million dollar condos and townhouses. Chelsea was now one of the areas of New York City most representative of the contemporary hedonism of tourists and locals alike. Yet we see signs of hope – of attempts to establish contact both with the visitors and the residents of this neighborhood. 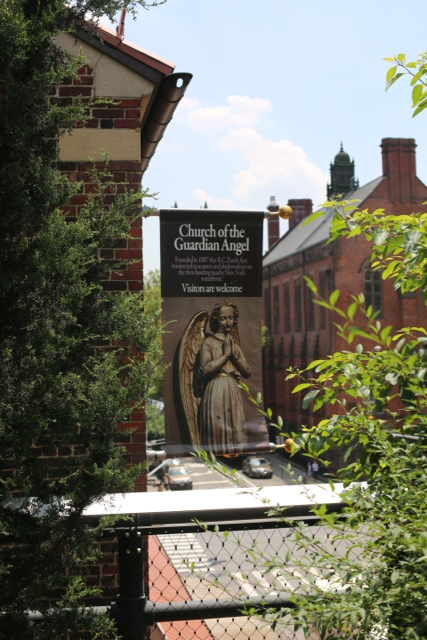 The parish has had the foresight to hoist a banner near the roof so those milling on the High Line can see it; it has also made colorful pamphlets available in the church of both Guardian Angel and Saint Columba. The combined parish website is very fine. And of course what is now a rarity in Manhattan parishes: the parochial school of Guardian Angel continues to function. So we would hope that what once was a mission church to the gritty waterfront will develop an entirely different mission: reaching out to the unchurched who find themselves, either as inhabitants or tourists, in a contemporary neighborhood of leisure and luxury. 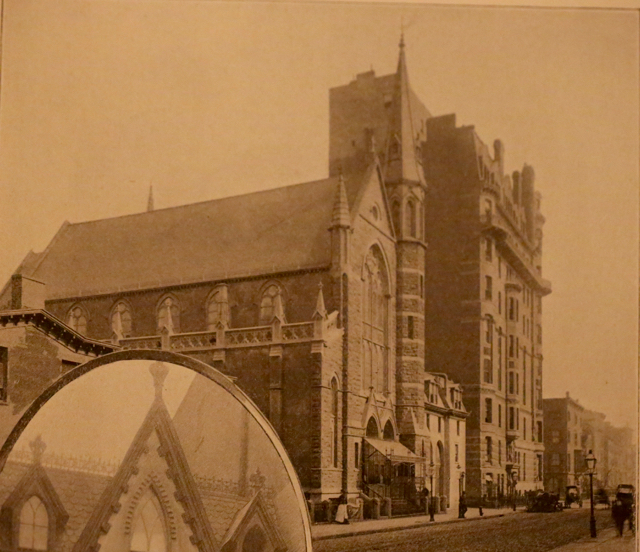 (Above and below) The church abuts directly on the High Line – the building of which was the cause of its present location. The view from the High Line:(Above) Haha – you are likely to be disappointed! But, seriously, wasn’t the opportunity to peep into nearby hotels and apartments one of the original attractions of the High Line? (Below) Guardian Angel fights back by hoisting this banner, level with the footpath of the High Line. (Above) Seen from the High Line, much of Guardian Angel is obscured by foliage – no peeping into the apse windows is possible! 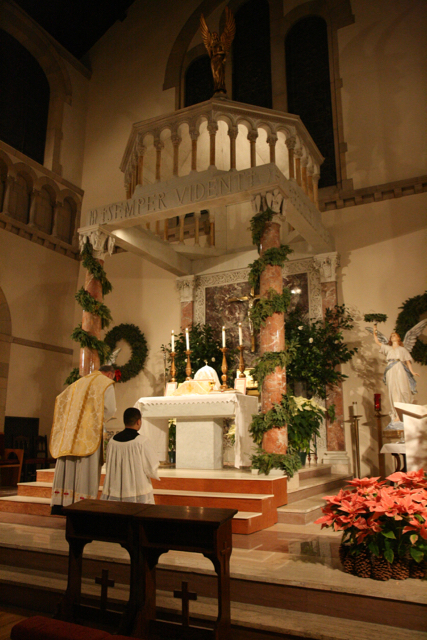 Under a prior management, traditional masses at Guardian Angel: (Above) January 8, 2008, showing Christmas decorations; (Below) Later in 2008 – Msgr Gilles Wach, ICRSS, celebrant. 3) The New York Times,February 8, 1946 page 3. 4) “Mass for Dockmen Offered on Pier: a unique Setting for a Communion Mass” The New York Times, May 8, 1950. 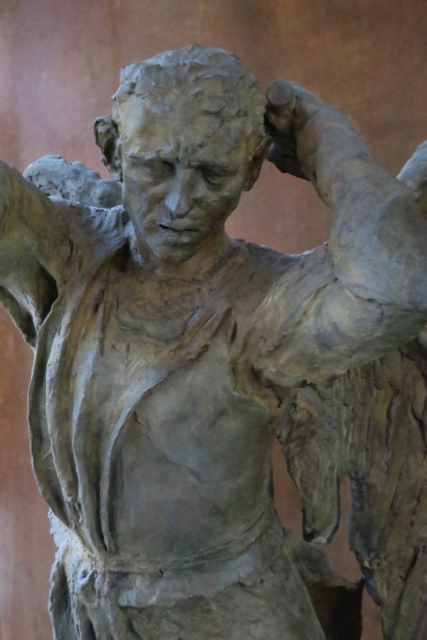 It has been described as a kind of counterdemonstration by the pastor of Guardian Angel to the “black legend “ of the waterfront (seen in “On the Waterfront”) allegedly propagated by the Jesuits. See Fisher, James T., On the Irish Waterfront: The Crusader, the Movie, and the Soul of the Port of New York (Cornell University Press, Ithaca and London, 2009) at 139-42. 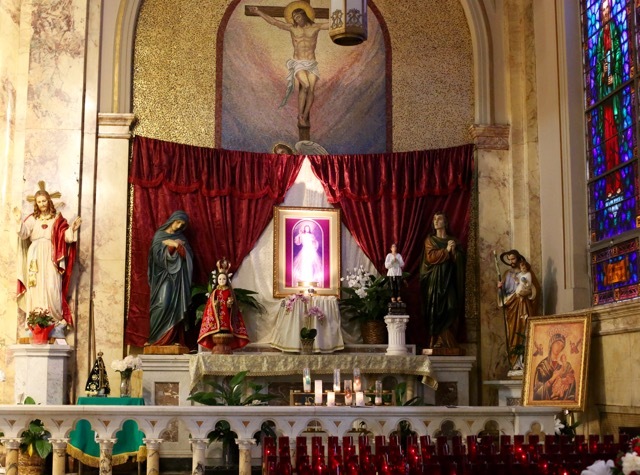 Nowadays, the only New York Italian church that rivals Our Lady of Pompeii for public recognition is Most Precious Blood fronting on Baxter Street. For it lies in the very heart of “Little Italy” – that prime touristic hot spot in New York. For as long as I can remember the immediate neighborhood of this parish has been a kind of Italian Disneyland with throngs of visitors, souvenir shops, a couple of decent food stores and row upon row of restaurants, some good, many not so good. 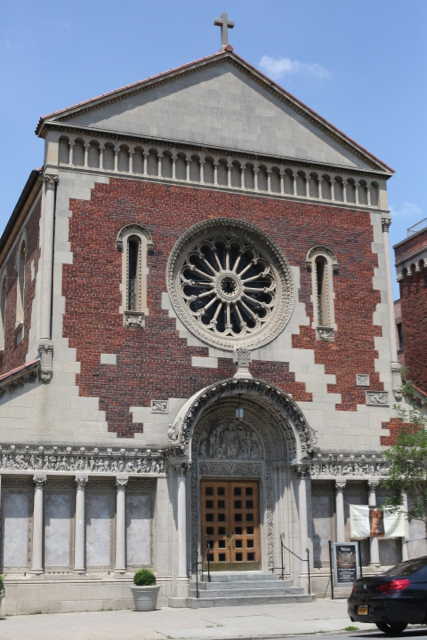 The Franciscans were able to complete the church in 1904 ( it was dedicated by the apostolic delegate to the United States) In 1914 they added a fine stone façade in a Romanesque style. 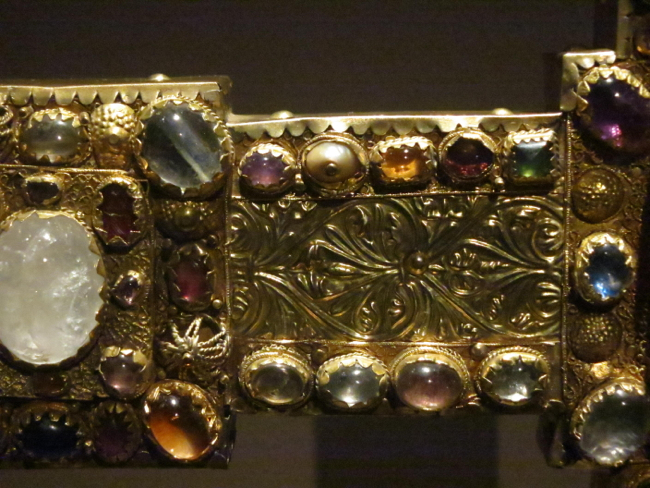 2) It is very nice – so typical of the fine work lavished in that era upon even minor parishes. The “renaissance” interior of the church, although modest in scale, is balanced and harmonious. 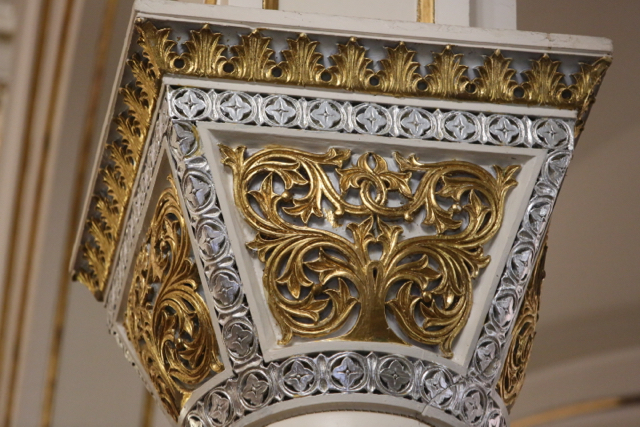 And like the exterior, some of the details (like the capitals) are well done. (Above) The same interior in largely natural light in 2009. The facade, executed in a fairly standard Romanesque style reminiscent of some Victorian buildings – but also recalling the Norman cathedrals of Southern Italy? 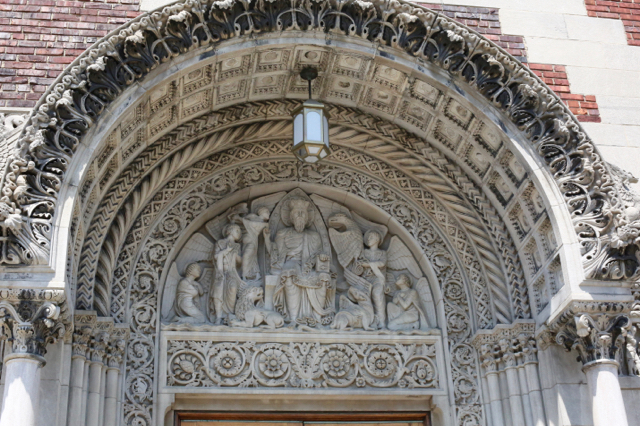 (Above) The elaborate portal as decorated as a “holy door” in 2016. 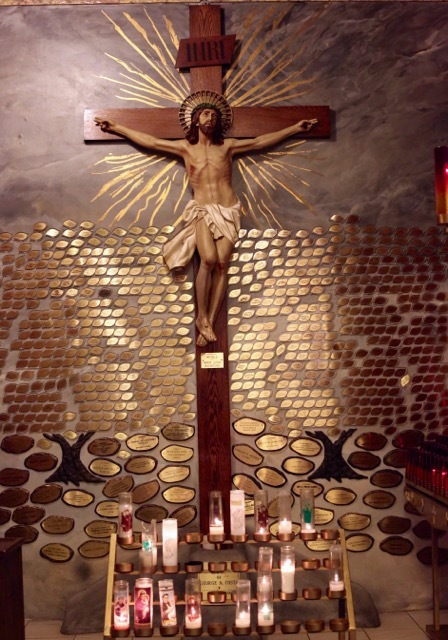 But, like Our Lady of Pompeii, it not so much the architecture of Most Precious Blood but the decoration that catches our attention – its exuberance forms a stark contrast to the “classical” restraint of the building. 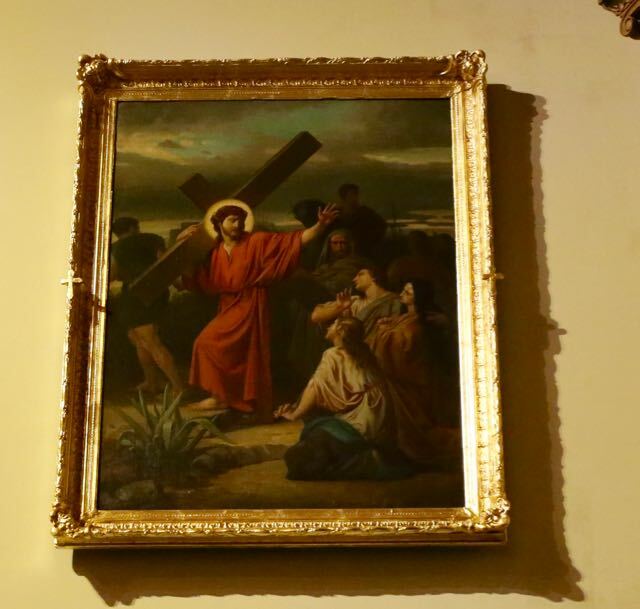 For the images, paintings and devotions of this church seem innumerable. 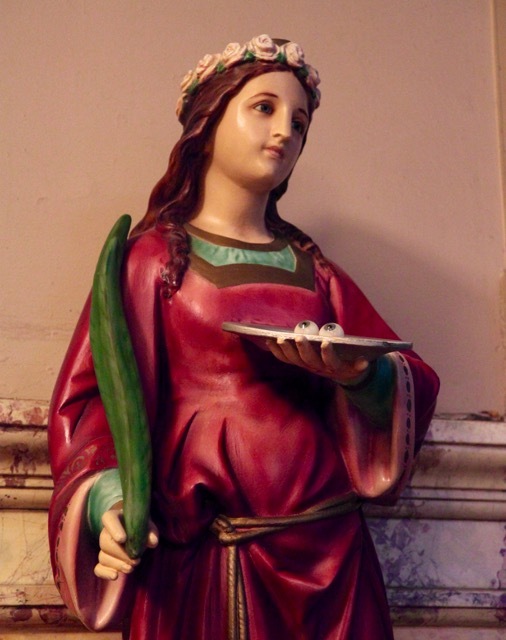 Compared to Our Lady of Pompeii, there is a more specific South Italian focus – including intriguing images of the patron saints of less well known towns and villages. 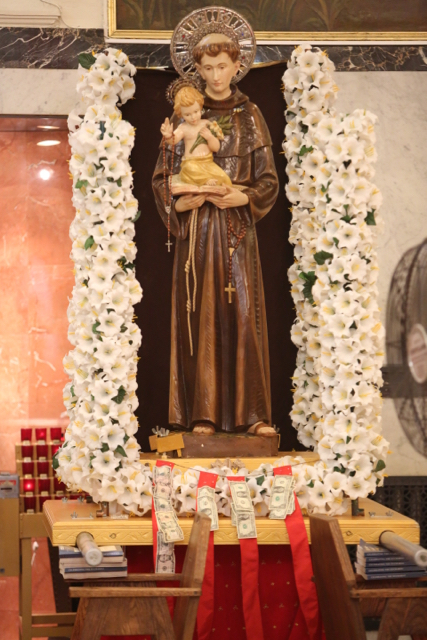 (Above) St Anthony of Padua decorated for a procession. 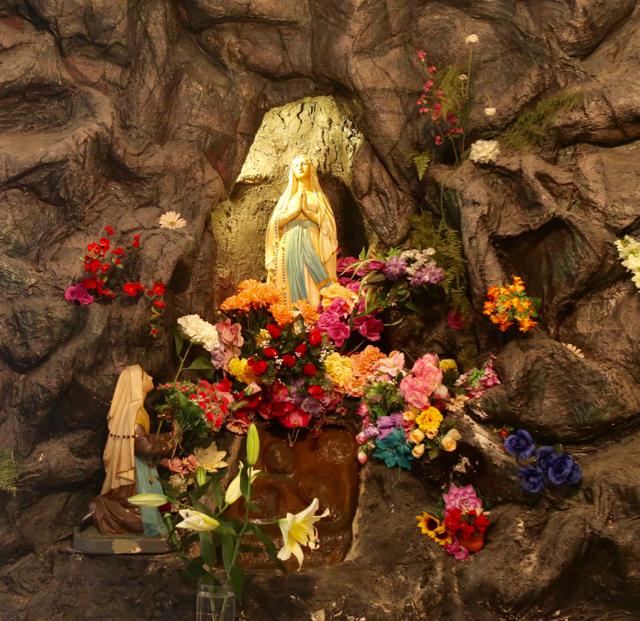 Some universal devotions have been “Italianized”: (above) The German/Hungarian princess St. Elizabeth is given Italian features; (below) a typical New York Lourdes grotto is transformed by beautiful flowers. 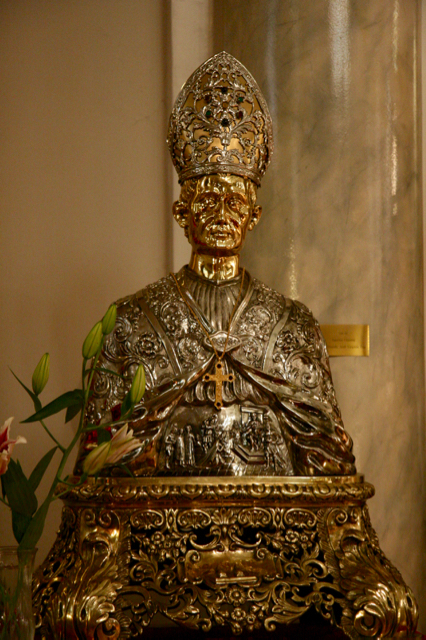 (Above and below) The saint most closely associated in the popular mind with this church: Saint Januarius (San Gennaro) bishop of Naples. 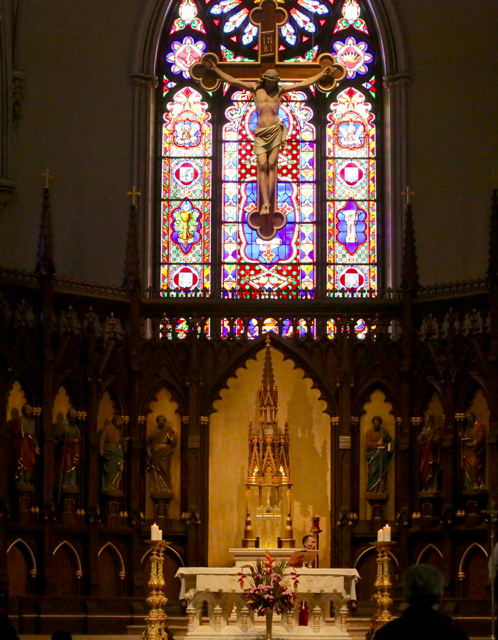 Most Precious Blood had been magnificently restored in the 1990’s. But by 2014 the congregation had dwindled to few hundred. 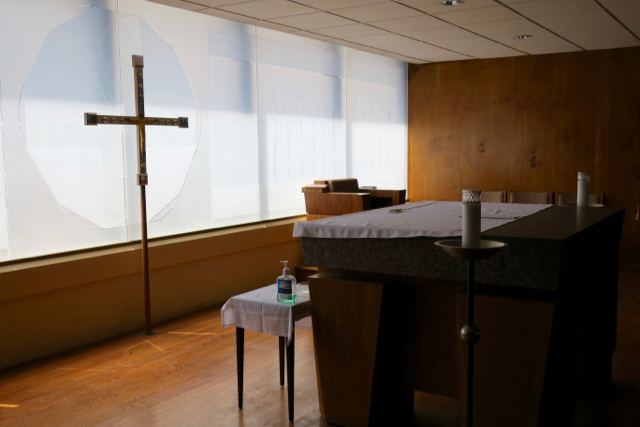 The last Franciscan pastor, 88-year old Fr. Fabian Grifone, celebrated his last mass in the parish early that year and the Franciscans gave up their mission here after 120 years. 7) It looked like Most Precious Blood would be “low-hanging fruit “ for the “Making all Things New “ planners – especially given that spiritual, historical and aesthetic factors counted for nothing. Despite this church’s location in a tourist zone, general indifference seemed to prevail regarding the likely fate of this church. I believe in the case of the last church Cardinal Dolan is referring to Most Precious Blood. 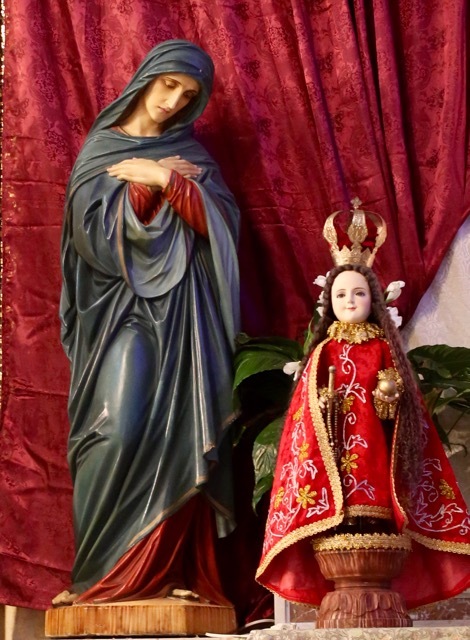 So did Our Lady of Lavang, whose image is one of the latest additions to the devotions of Most Precious Blood, stretch out her protecting hand over this church? Since 2015 Most Precious Blood church is no longer a parish but the “Shrine Church of the Most Precious Blood” a chapel of St. Patrick’s church to the north. Is this twist of fate not appropriate? – was not for many decades Old St. Patrick’s itself de facto an Italian ethnic parish? 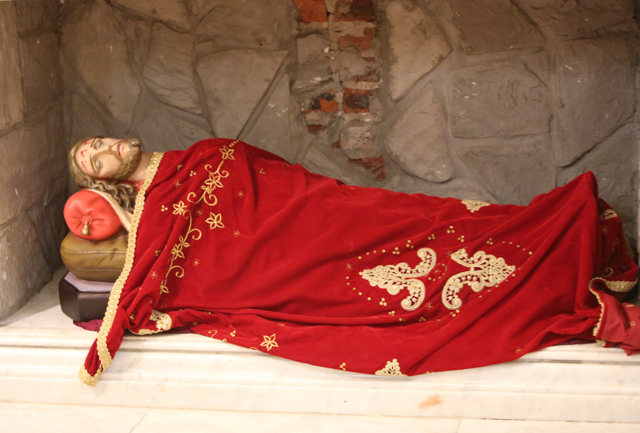 On Sunday, however, only one mass is now celebrated at the shrine – in Vietnamese. 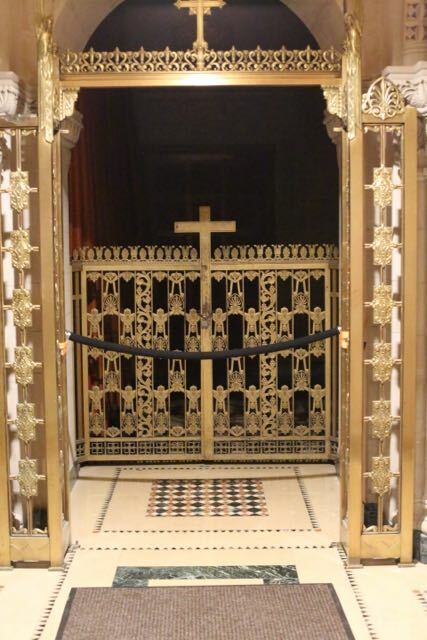 10) And yet in this year one of the Archdiocese’s Holy Doors is located here. Perhaps this bodes well for the future – perhaps it will attract visitors who, instead of just seeking out food and raucous festivity , feel somehow called to rediscover their heritage both spiritual and historical. 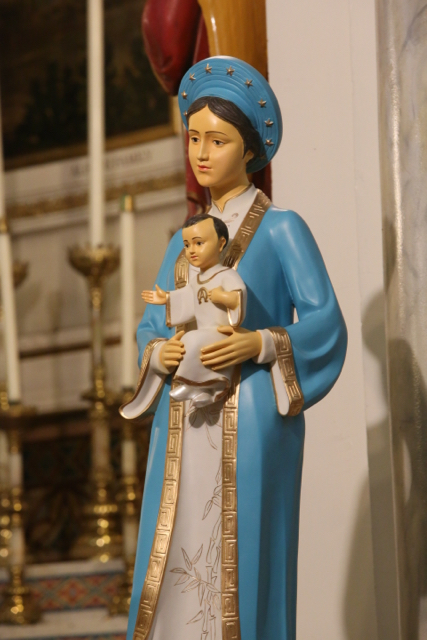 A new addition (apparently since 2009): Our Lady of Lavang, a Vietnamese devotion. But she apparently played a key role in saving this church! 1) The Catholic Church in the United States of America, Vol. 3 at 352; Vol. 1 at 236-37. (Catholic Editing Company, New York 1914). 2) The Catholic Church in the United States of America, Vol. 1 at 236-37. 5) Tonelli, Bill. “Arrivederci, Little Italy”. (New York Magazine, September 27, 2004). 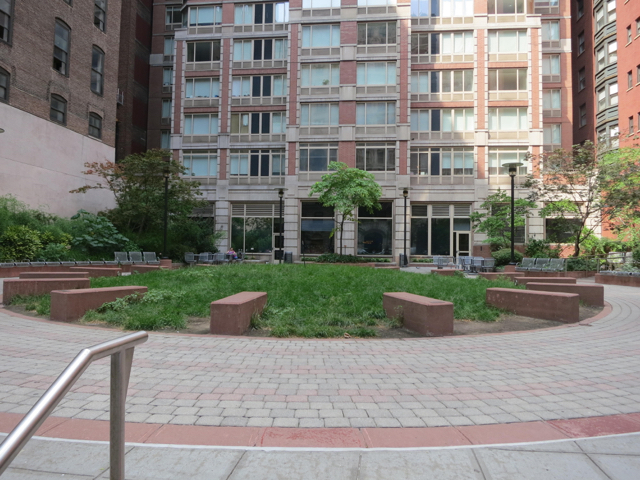 If you wander south on Sixth Avenue in the Village you’ll find at the intersection with Bleecker Street a small park offering some respite from the surrounding aesthetic and moral decrepitude. And towering over the park – named after a Catholic priest – is a church enjoying an unusually prominent and visible location. A tall tower and baroque facade surmount a somewhat institutional exterior with large windows resembling those of an old-time library or school. A step inside, however, reveals an incredibly extravagant, bright and colorful vision. In a Renaissance-style church interior, innumerable statues surround elaborate marble altars and also line the sides and rear of the nave. 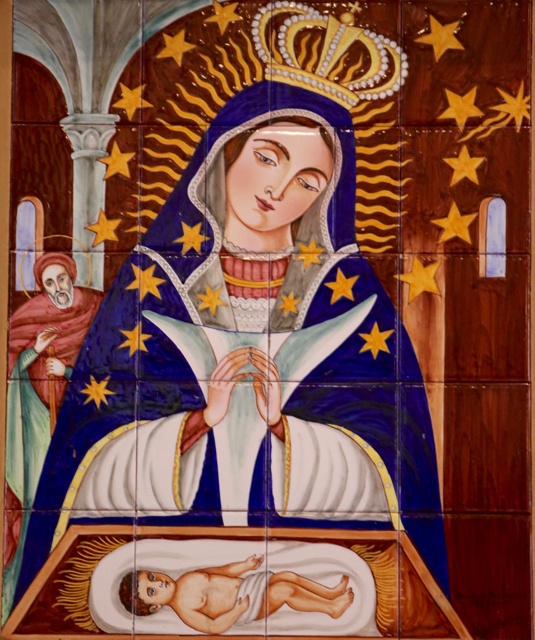 Paintings, mosaics and stained glass seem to cover every surface, crowned by a grandiose mural of Our Lady of the Rosary over the sanctuary. 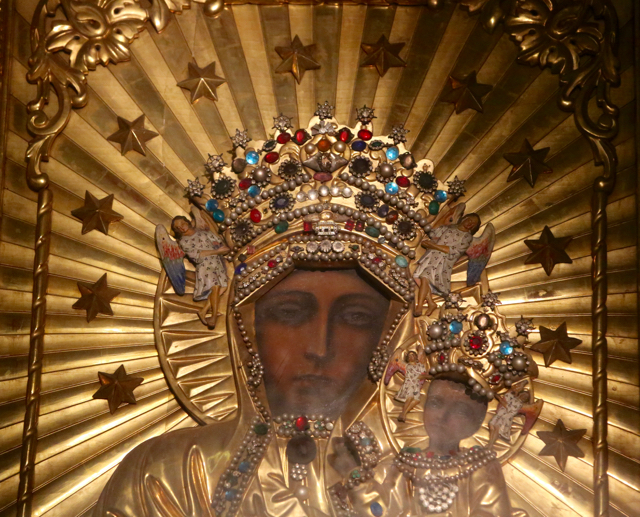 It is an exuberant, overflowing Catholicism that can be found only in an Italian ethnic parish – that is, if we ignore certain earlier German, Slavic and even “Irish” parishes of the city. 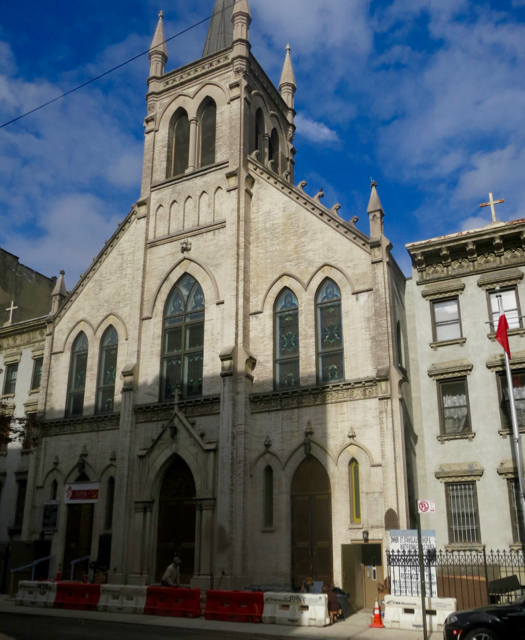 Now St. Anthony of Padua, a few blocks to the south, may be the oldest Italian Catholic church in Manhattan. 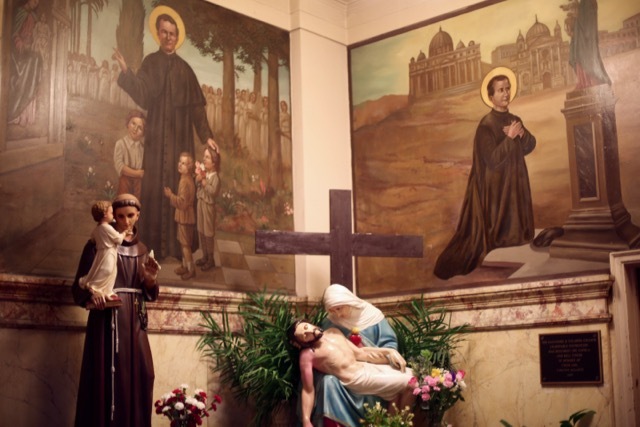 Our Lady of Mount Carmel in East Harlem may be the most impressive and important in New York Italian-American history. 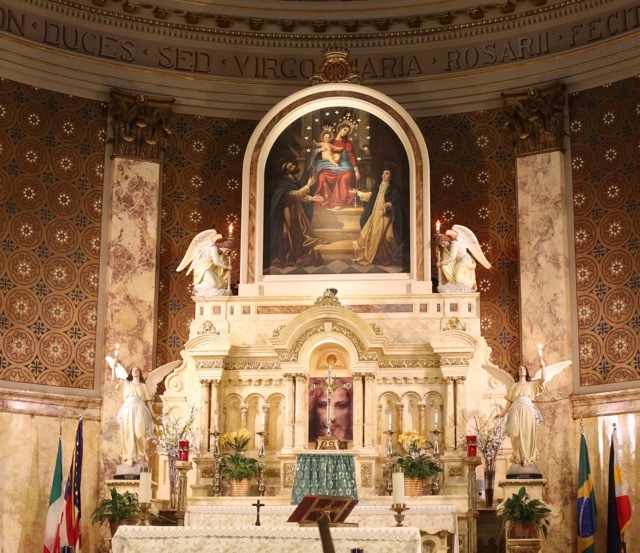 Yet, I am sure that whenever a New Yorker thinks about an “Italian church” nine times out of ten it is this one. For it is big, lavishly decorated and occupies a very prominent site in a well-known part of town. 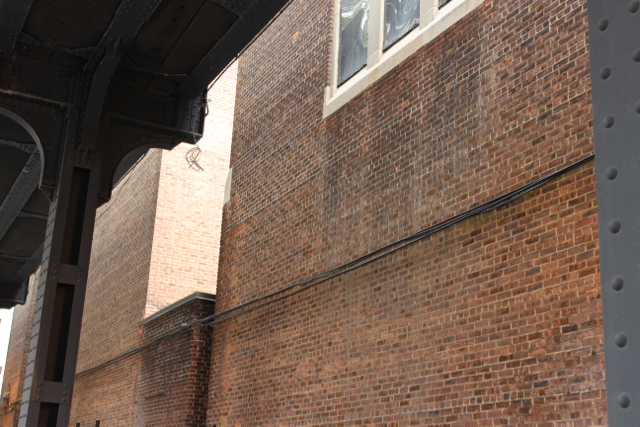 An area, moreover, that remained a relative safe zone for visitors throughout the high crime decades of the City. 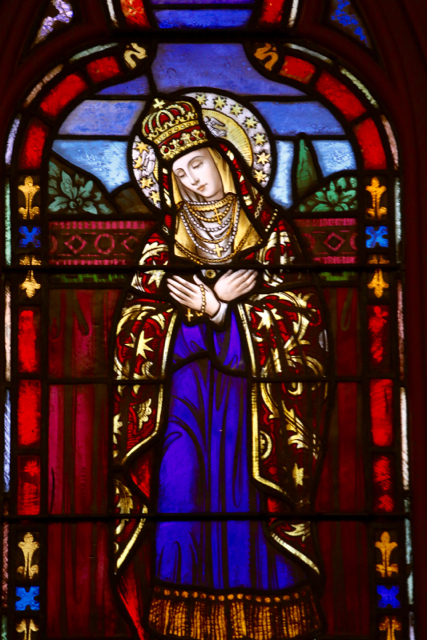 Strange: the old parishes of New York so often originated in individual initiatives by diocesan or religious clergy, laity and wealthy donors – or in the case of Our Lady of Pompeii, all three together. It contrasts with rigidly centralized top-down management of the archdiocese today! And, as in many other cases, the image currently propagated of the 19th century Church – exclusive clericalism, universal grinding poverty, animosity between Irish and newer immigrants – needs extensive nuancing. The old church must have been grossly inadequate – but soon relief came from an unanticipated development. In 1923, Sixth Avenue was to be lengthened to the south and Our Lady of Pompeii was squarely in its path. The old church was demolished and Fr. Demo built the present lavish new structure, completed in 1928. It was a combination of church, school, convent and attached rectory. 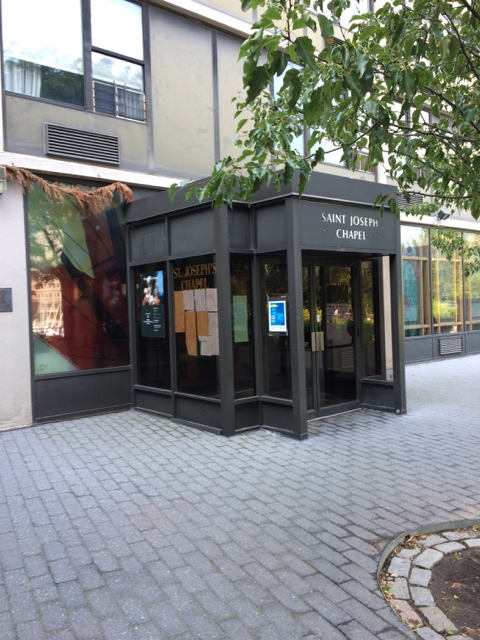 Given the high cost of land in Manhattan, such multipurpose structures were often built in New York City in that era – one thinks of Corpus Christi parish, the recently closed St. Stephen of Hungary or what is now the “Villa Maria.” But none of these are on the scale of Our Lady of Pompeii! Moreover, the tall solitary tower facade recalls vaguely the tall, stand-alone campanile of the original shrine in the “old country.” A parochial school was opened in 1930 staffed by the “Zelatrices” (after 1967, the “Apostles” of the Sacred Heart).3) The bulk of the decoration of the church – high altar, murals and windows – was completed between 1934 and 1941. 4) Regrettably, Father Demo himself did not see most of this: he had effectively resigned the pastorate in 1933 amid worsening economic conditions and died in 1936. 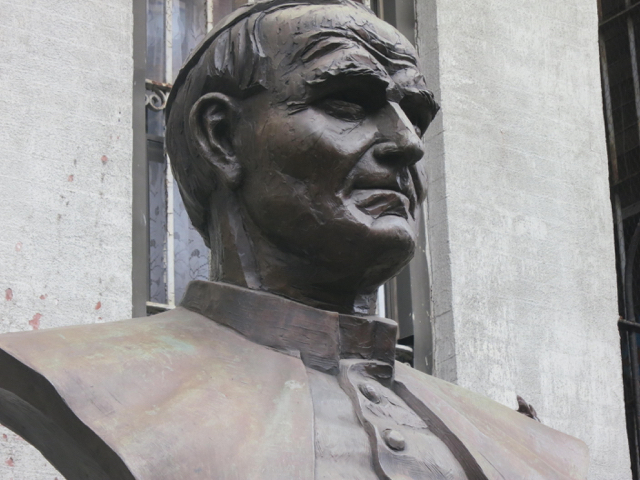 5) The park in front of the church was named after him in 1941. 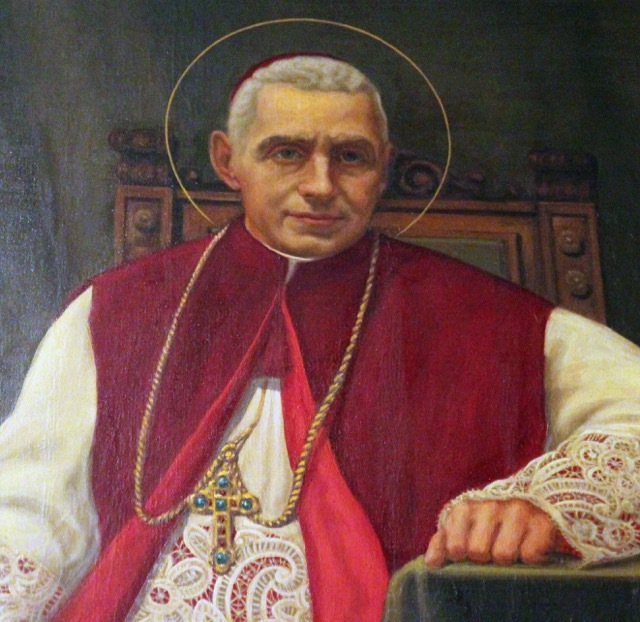 (Above) Blessed Giovanni Battista Scalabrini, Bishop of Piacenza and the founder of the Missionaries of St Charles Borromeo (the “Scalabrini Fathers”), as depicted in a painting in Our Lady of Pompeii. 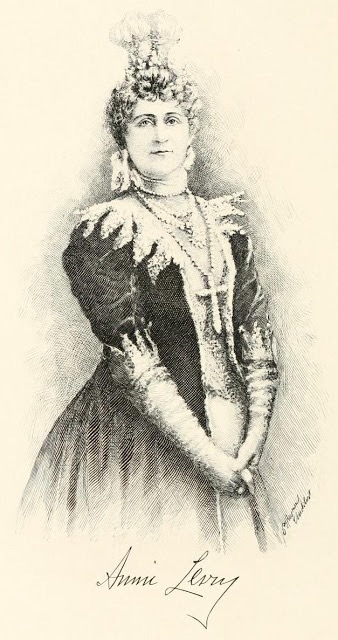 (Above) Countess Annie Leary (her title was papal) was a wealthy, exceedingly generous, but strong-willed and often difficult woman. She was a colorful figure in New York society and Catholic charity up till her death in 1919. 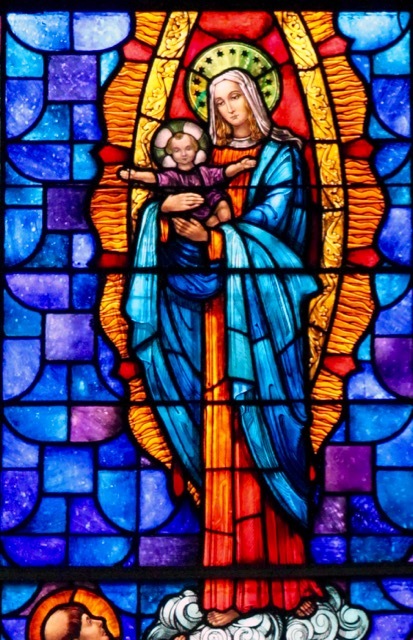 In addition to her support of various initiatives to aid Italian immigrants (including the founding of Our Lady of Pompeii), she created a Catholic chapel at Bellevue hospital (the magnificent Munich stained glass from that building is still at Bellevue), funded the erection of the statue of Christoper Columbus on Columbus Circle and helped the contemplative order of nuns of St Mary Reparatrix come to New York and take over the parish of St Leo. She is buried under Old St. Patrick’s Cathedral. 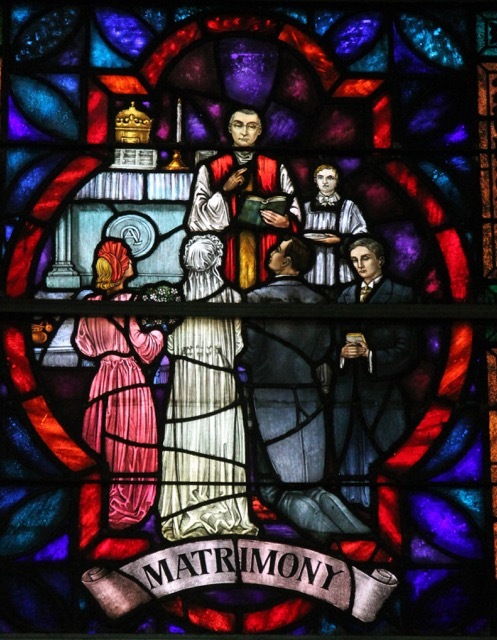 (Above) The priest in this stained glass window from the late 1930’s is said to have the features of Fr. Antonio Demo. 7) He oversaw the fantastic expansion of the parish and the building of the present church. (Above and Below) These pictures give some idea of the profusion of images in this church. 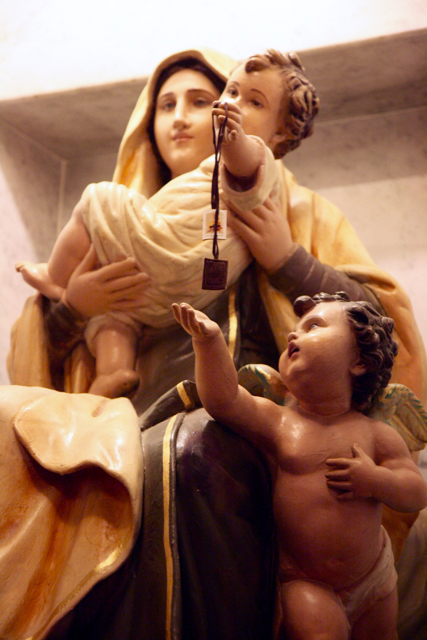 Images of Brazilian and Filipino devotions supplement the original Italian inventory. (Above) A sign of today’s Church? 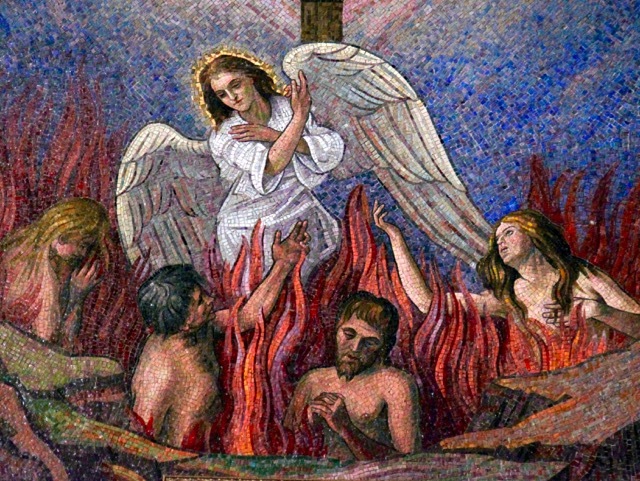 This mosaic of the poor souls in purgatory is now ( June 2016) covered by the backdrop for the “image of mercy.” See photograph immediately above this image. 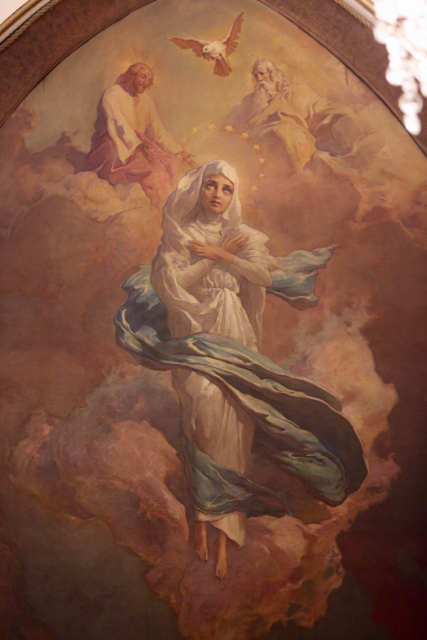 (Above) The grand mural of Our Lady of the Rosary. 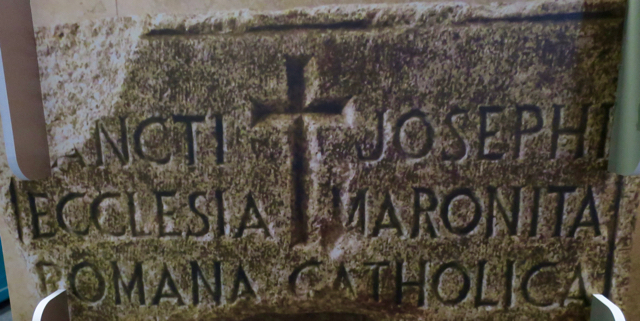 (Below) This detail and the inscription refer to the battle of Lepanto. – The new immigrant groups: in the case of Our Lady of Pompeii, Brazilians and Filipinos. Vatican II, as always, made a major contribution to this crisis. The parish history makes clear that this parish went through a traumatic time particularly between 1970 and 1975. 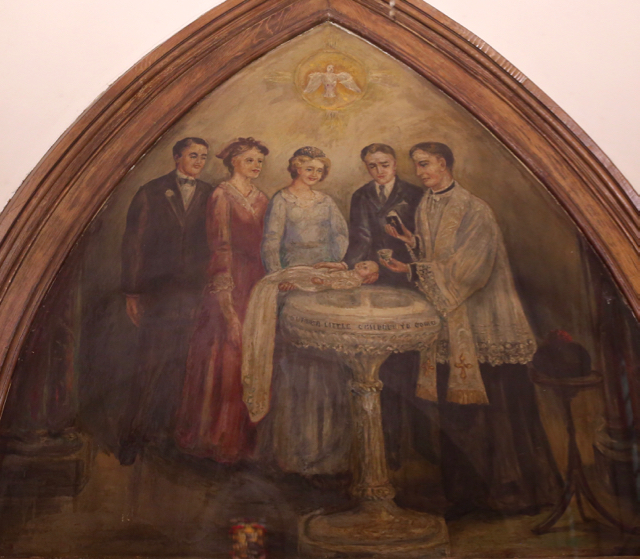 The most dramatic step was the removal and repainting of the mural that is the centerpiece of the church. 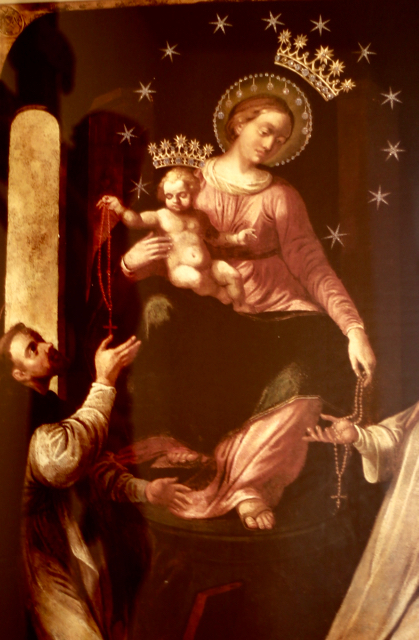 You see, this painting of Our Lady of the Rosary contained images of the poor souls in purgatory and of the battle of Lepanto that were and are anathema to the Conciliar Church. But then events took a very different turn from those at Our Lady of Pompeii’s next-door neighbor to the north, St. Joseph’s. In contrast to the total housecleaning pushed through there, real resistance emerged at Our Lady of Pompeii. 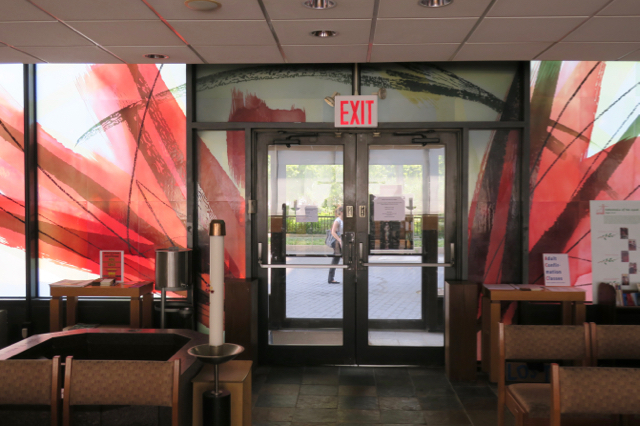 The removal of the mural was but the preface to the pastor’s proposed wholesale restructuring of the sanctuary. A poll was taken of the parishioners and of 220 who responded only 40 chose the option “to change in conformity with Vatican II”; 114 wanted no change at all. Further renovations were stopped. The pastor resigned; indeed, there were a half-dozen pastors of this parish in the period 1964 to 1976. 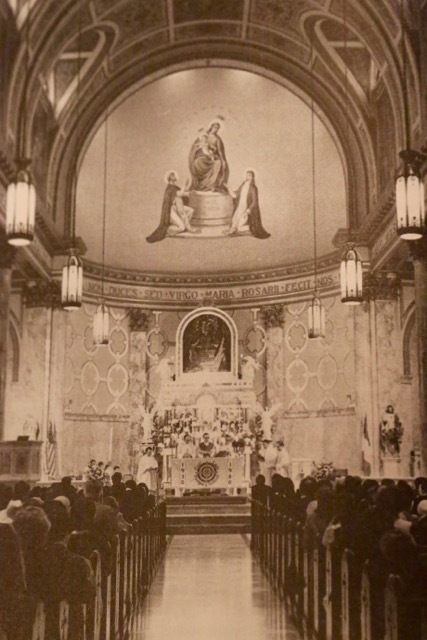 12) In 1985, amid the jubilation of the parish population,a copy of the original 1937 mural replaced the “Vatican II” version. 13) This is one of the few successful instances of resistance to the so-called Vatican II reforms in New York of which I am aware. Since then things have calmed down. 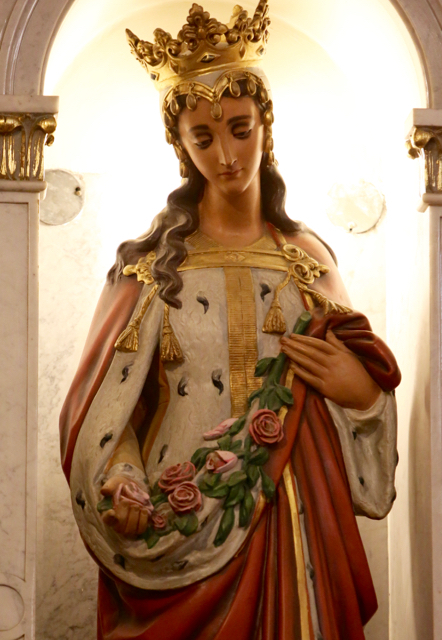 The parish positioned itself more and more as a “Shrine” of Our Lady of Pompeii transcending diocesan boundaries. 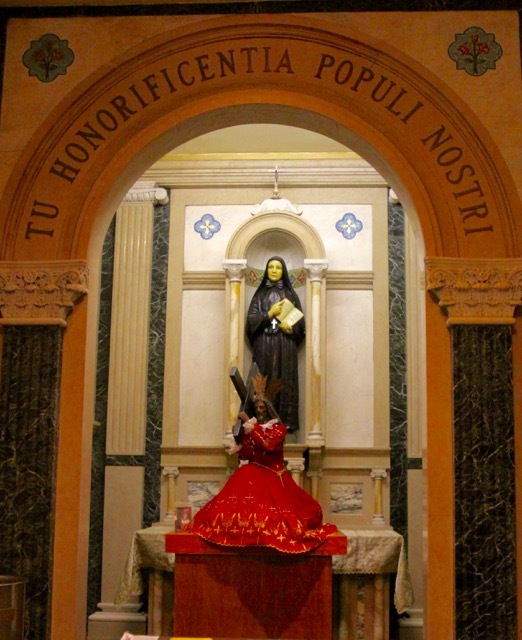 An annual Serata Italiana brings back old parishioners and hopefully attrracts newcomers. 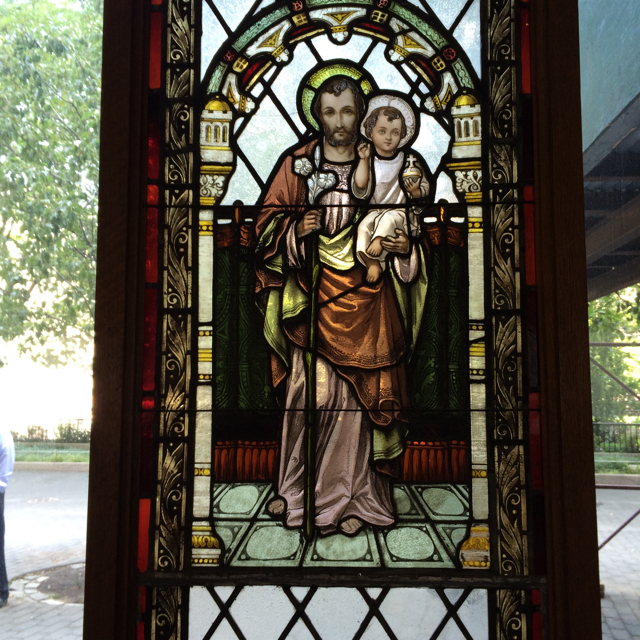 The parochial school has continued to function: a rarity in New York City parishes. 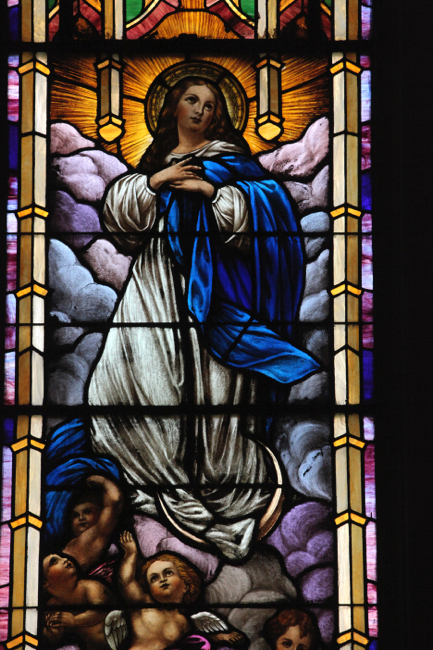 Moreover, in contrast to many others, Our Lady of Pompeii school emphasizes its Catholic identity. The parish played more and more the role of a provider of social services. And of course there is the steady stream of tourists visiting the Village. 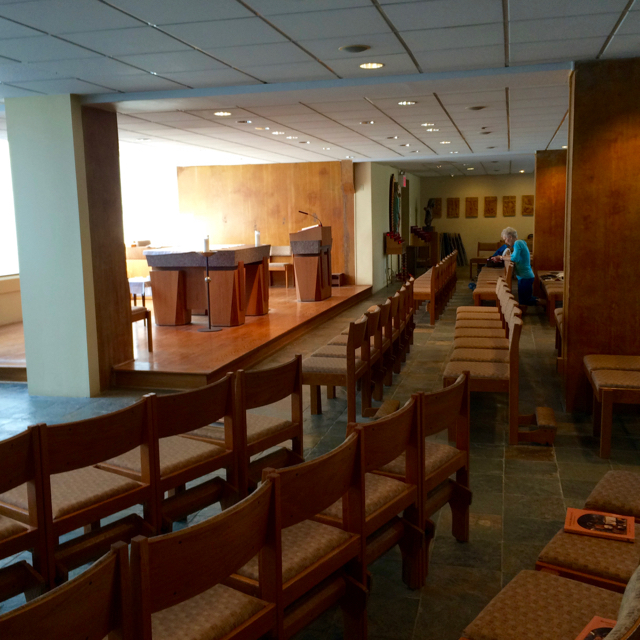 Some drop in now and then to admire the decor of this resolutely non-modernist church. 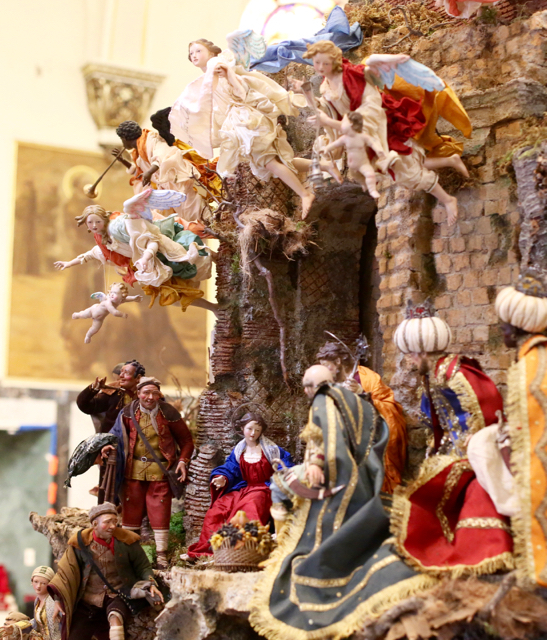 It is the extravagant interior – truly Catholic and Italian -that draws them. It captures the overflowing and superabundant nature of grace and of creation. 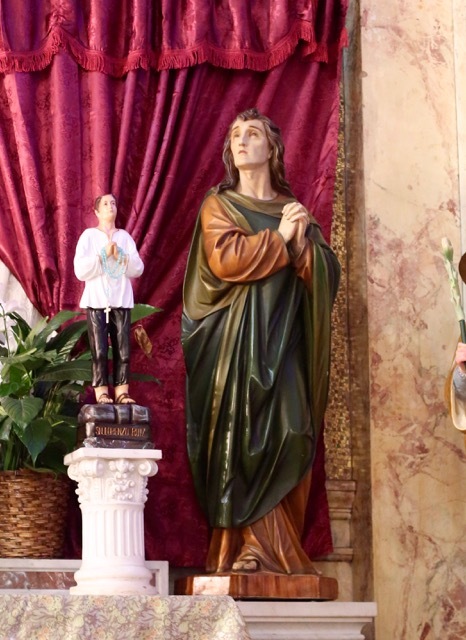 To the many devotions established by the Italian parishioners new immigrant groups have added their own statues and pictures. 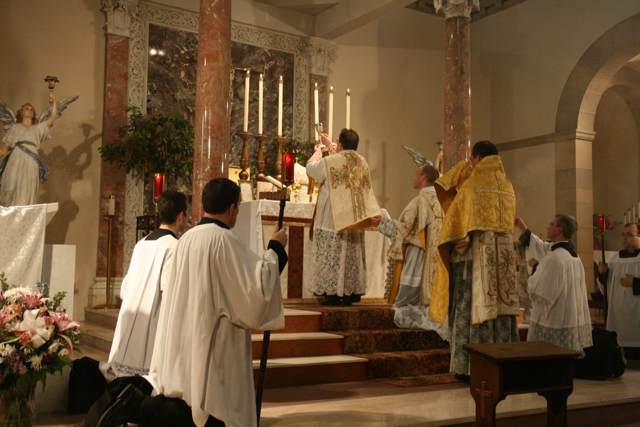 It is the very nature of Traditional Catholicism as opposed to Conciliar Catholicism: a multitude of paths to the Divinity open to the individual believer, not a exclusive focus upon a priest celebrating the “liturgy” in a bare room. And yet, it’s not a jumble of individualistic caprices, but “it all hangs together” (Eric Gill) in wondrous harmony! 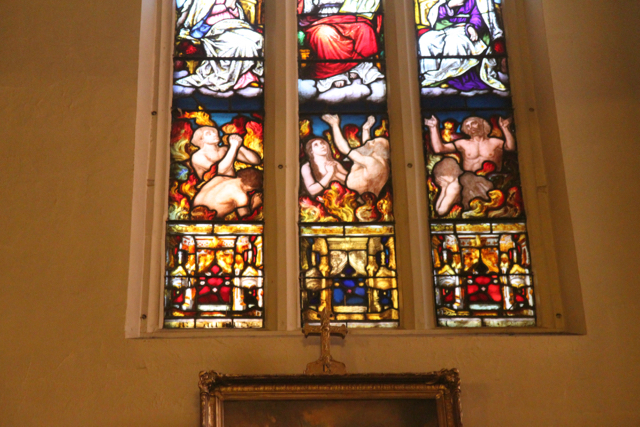 Admittedly, a closer inspection of the statues and the stained glass reveals that, generally speaking, they are not of the absolutely highest quality. 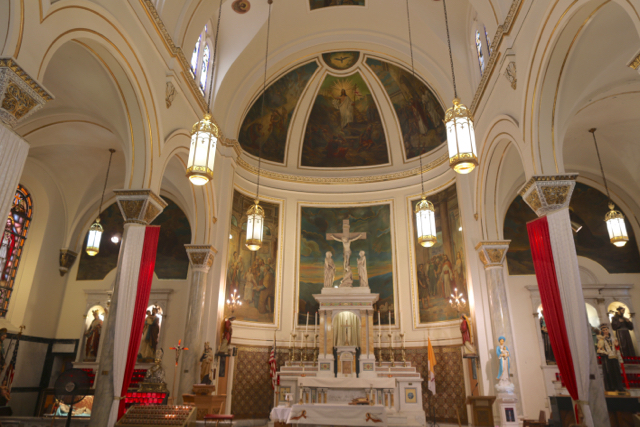 As in other lavishly decorated Italian parishes (one thinks of Precious Blood in Little Italy or of Our Lady of Peace) these parishes at first lacked the financial resources of mainstream Archdiocesan parishes and those of religious orders. Then, by the time funds did become available for more ambitious programs of decoration, the quality of Catholic religious art had already started to decline. But the overall impression is magnificent: what sacrifices must have been made to achieve this decoration and, even more so, to restore and preserve it! If I am not mistaken, in the recent past more concrete elements of tradition long thought dead also have reared their head. The words of the pastor in the church bulletin are eminently solid. 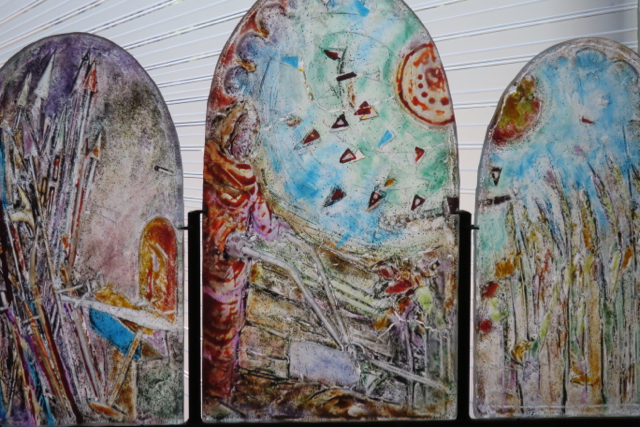 A course in traditional artistic techniques has been offered at the parish. And even a Solemn Traditional Mass was celebrated at Our Lady of Pompeii. Does this indicate the opening of an unexpected path to the evangelization of the neighborhood of this parish? Building on the great legacy of the past but moving beyond nostalgia and folklore, does the fullness of Tradition offer a way to establish contact with the many non- or even anti-Christians who now dwell in affluence where impecunious immigrant Italians did generations ago? 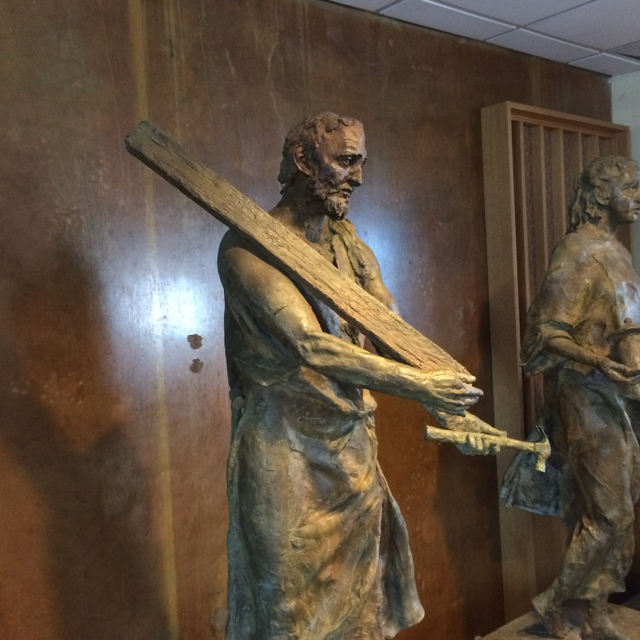 For it is clear that the other path (adopted by Our Lady of Pompeii’s next door neighbor, St. Joseph’s in the Village, in the 1970s) of accommodation to the mores of the neighborhood, the city and of the “American Catholic Church,” led in the end nowhere. I would be the first to admit that a project of evangelization in this area and at this time indeed would require a “leap of faith!” But with God all things are possible – and wasn’t the beginning of this parish – for different reasons – a challenge to evanglization too? Fortunately, thanks to the sacrifices of prior generations, Our Lady of Pompeii has a beautiful church and a functioning parish with which to start. 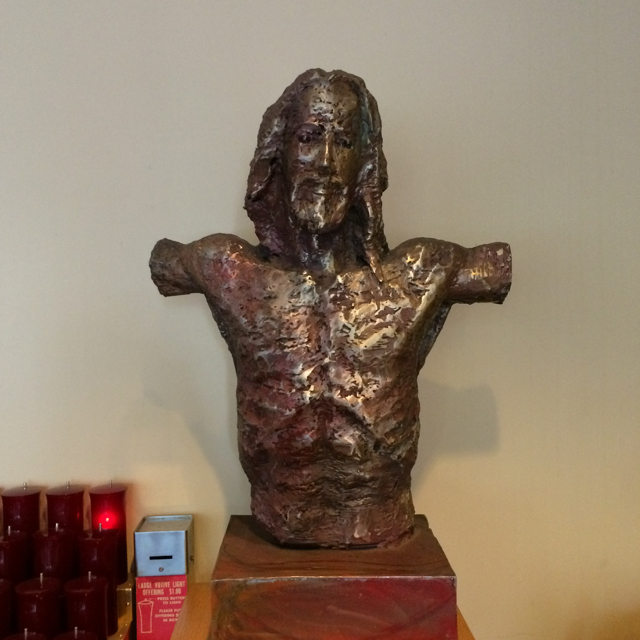 (Above) It’s hard to restrain Catholics practicing traditional devotions…. 3)Brown, From Italian Villages at 82-86;88-89. 4)Brown, From Italian Villages at 103-104, 106-107. 5) Brown, From Italian Villages at 98-99. 6)Brown, From Italian Villages at 110-11. The parish history helpfully adds “In 1940, all masses were in Latin.” Ibid. at 111. 7) Brown, From Italian Villages at 107. 8) Brown,From Italian Villages at 11. 9) Brown, From Italian Villages at 89. 11) Brown, From Italian Villages at 25; Brown, The Italians of the South Village at 50. 12) Brown, From Italian Villages at 143-47. 13) Brown, From Italian Villages at 163-64. 14) Brown, From Italian Villages at 136. 16) Brown, From Italian Villages at 155. 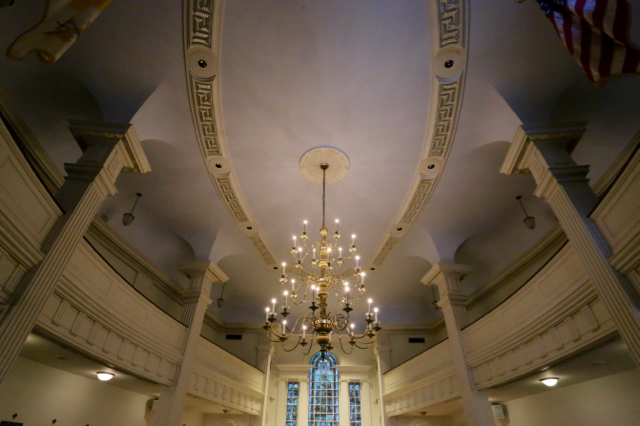 (Above) A wide angle view of the restored sanctuary. 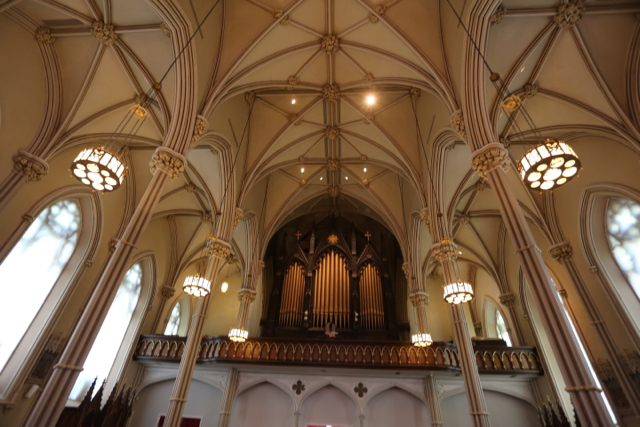 UPDATE: This post now reflects additional information on the restoration from the pastor of Old St. Patrick’s, Msgr. Sakano. Let me give you a brief visual status report on the still-incomplete restoration of old St.Patrick’s cathedral. 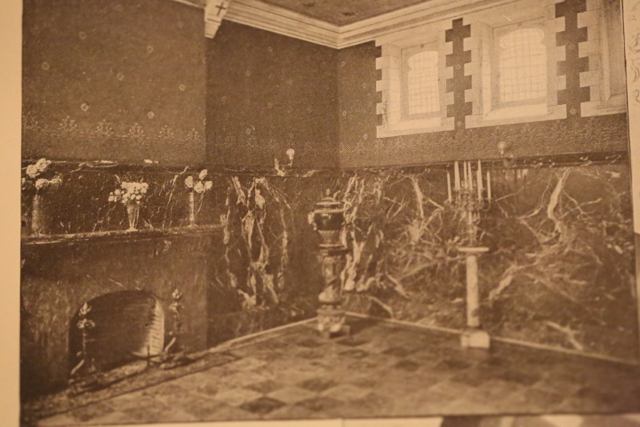 A picture in the New York Times had raised the specter of a brilliant, whitewashed interior. As you can see below, these fears have not been realized. The interior has been repainted but in a restrained cream or beige color. It is definitely brighter, however, than the olive drab of the prior color scheme. Msgr. Sakano informs us that this new color scheme is derived from the remains of the original decoration that had been discovered. (Below) The church prior to restoration. (Above) The view towards the rear. The magnificent organ still seems to be under repair. 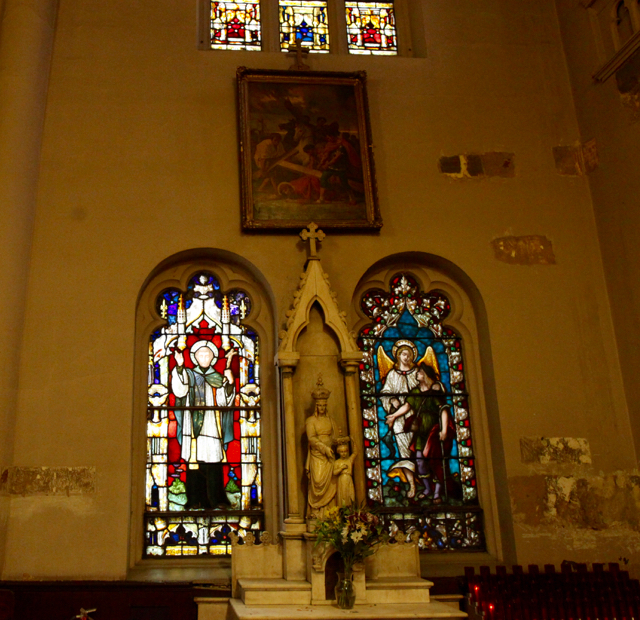 (above) The unrestored sanctuary; (below) as restored. 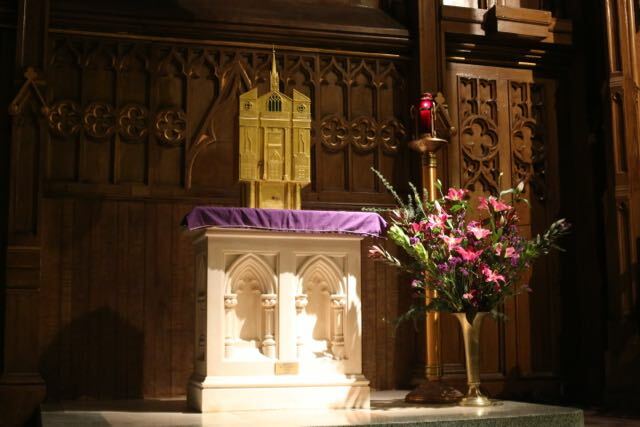 The tabernacle has been returned to the center of the sanctuary and the painting of the Resurrection has disappeared. This resembles the pre-Vatican II condition. 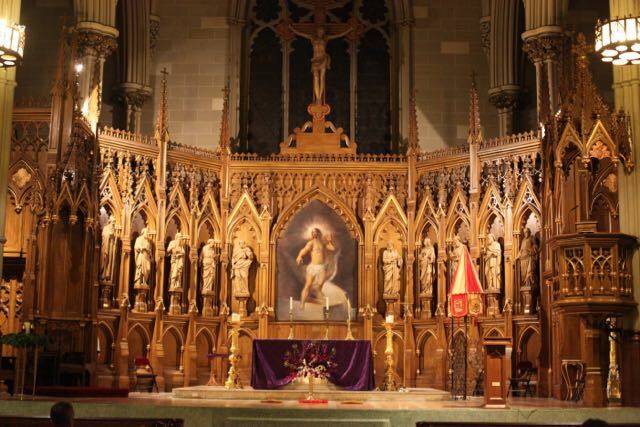 See our prior report showing the pre-restoration state of the cathedral including some pictures from pre-conciliar times. 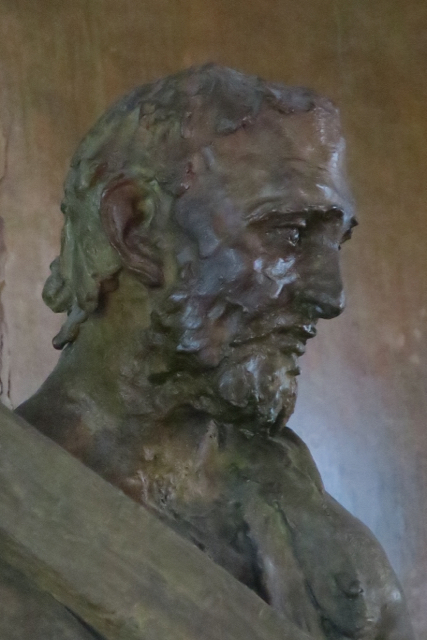 Frank Mason, the noted Catholic artist and champion of art preservation, created the image of the Resurrection in 1970 for the sanctuary when St. Patrick’s was “restored” after the Council. 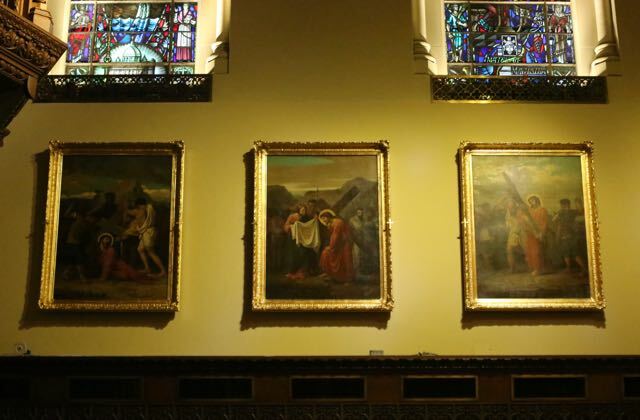 The painting is now deposited in the crypt where it will be installed permanently. 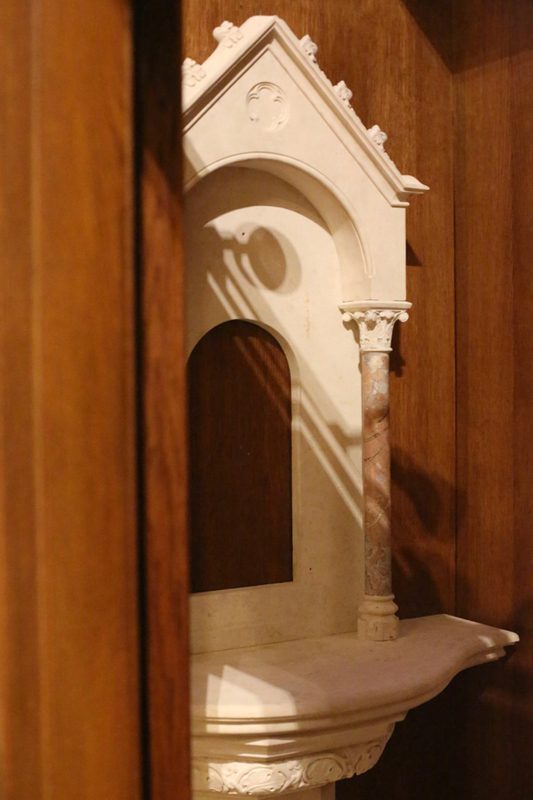 (Below) The prior location of the tabernacle (which depicts the original appearance of the facade of this church.) off to the side. 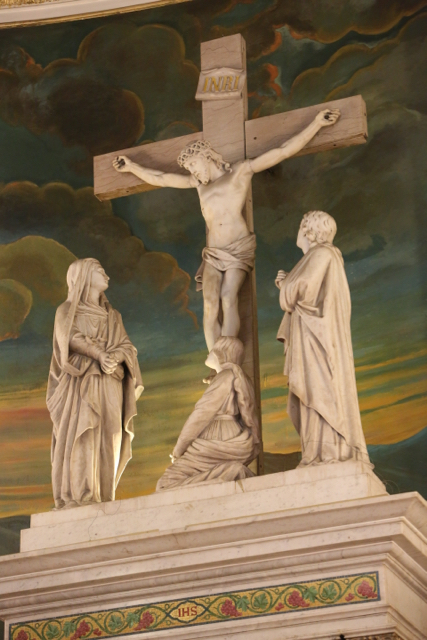 (Above) As restored – the crucifix is now suspended above the sanctuary and the painting of the statues has been restored. 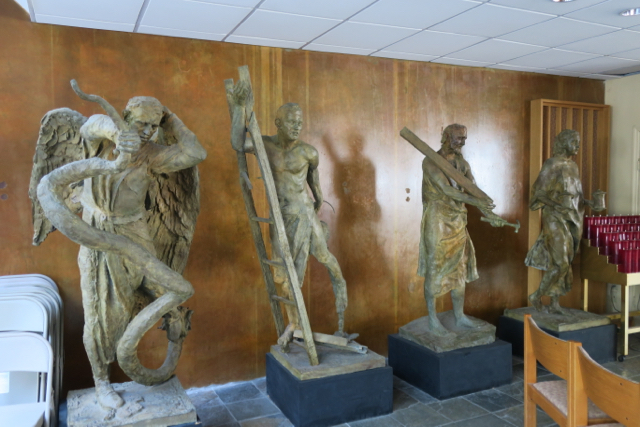 When restoration work started it was discovered that the statues’ original paint had been largely preserved under the 1970 – era paint job. With some touching up, that is what we see today. (Below) the prior condition. 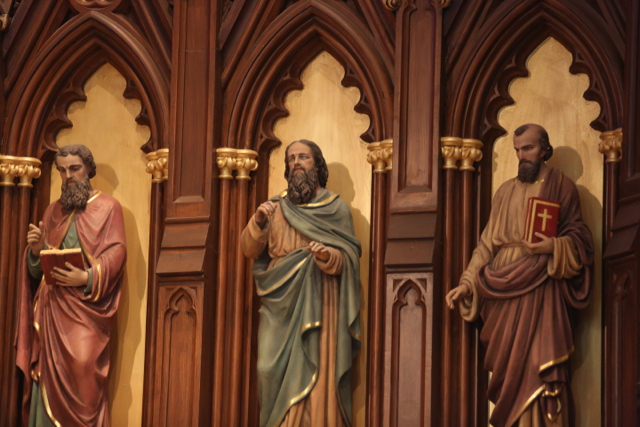 (Above and below) The figures of the reredos as restored to their original colors. 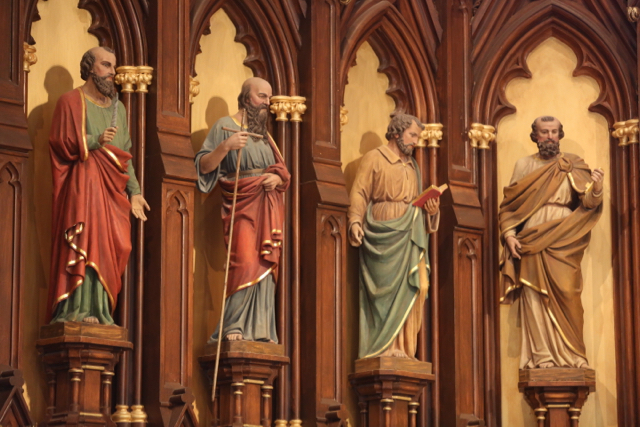 Msgr Sakano notes that for some reason there are only 10 apostles…. (above) A window pre-restoration; (below) restored. 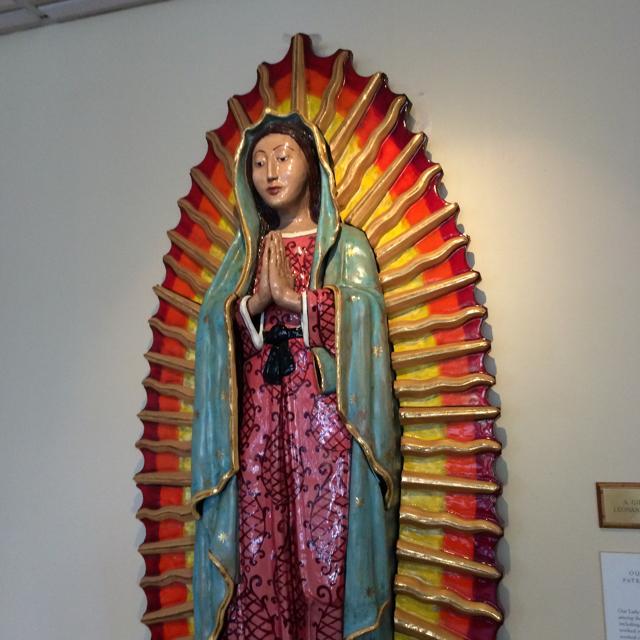 (Above) I believe this image of a South American devotion used to reside in a chapel outside the main church; it is now in the sanctuary. 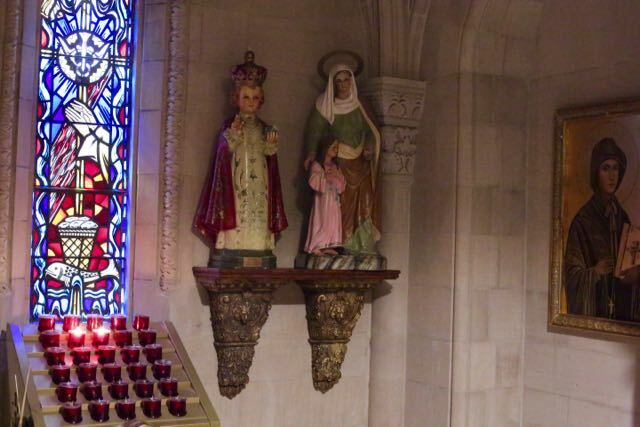 (below) If I am not mistaken, some statues have migrated from the ground level of the nave or sanctuary and now, repainted, stand high above on the reredos.